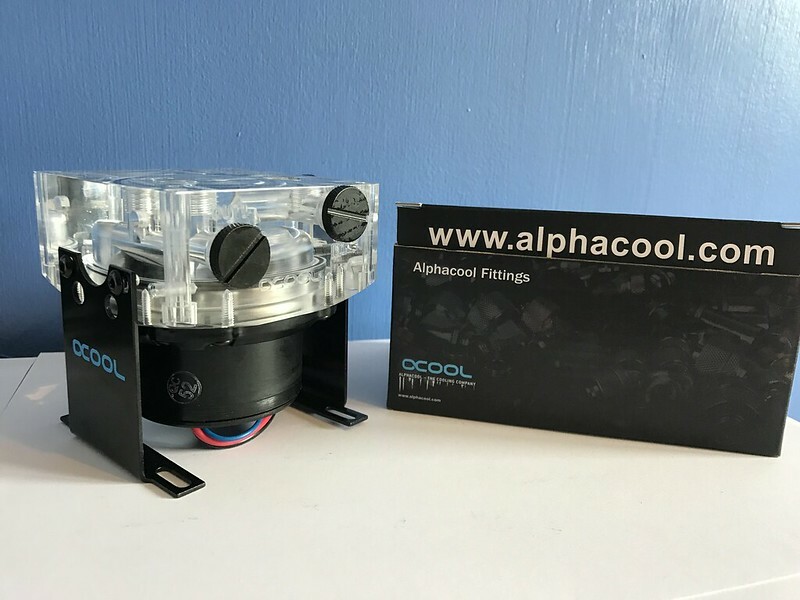 My name is Richard (AML Custom PC) this is my latest project, sponsored by Alphacool. 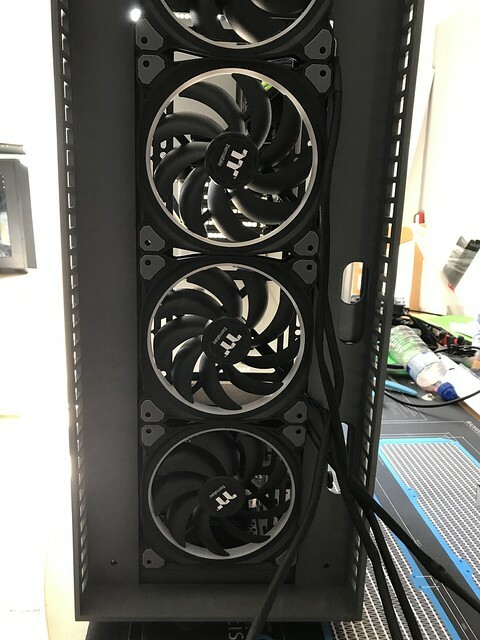 The case I am using is the thermaltake x71, I have not seen many mods with a dual loop in this case. 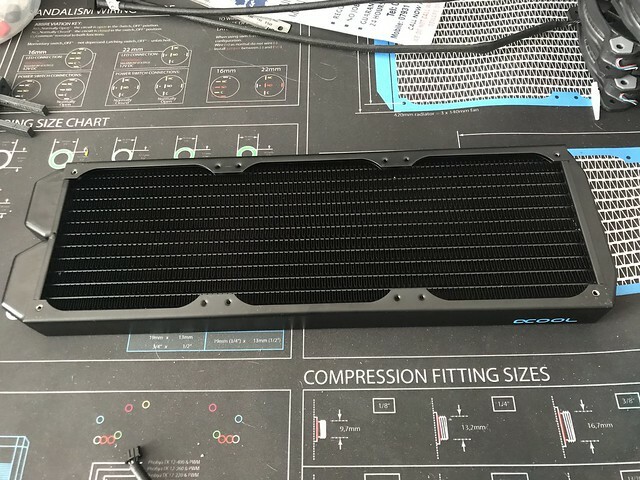 I am adding a new front tempered glass panel with custom fan grills. 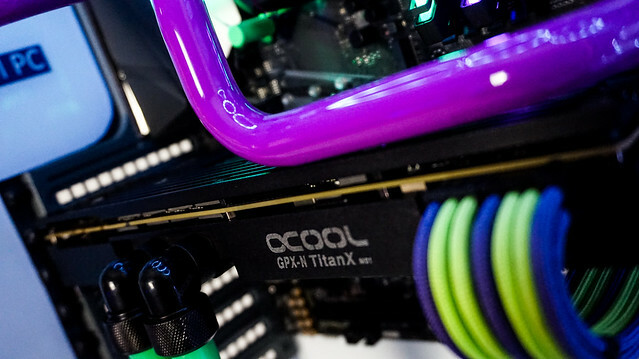 The colour of the build. 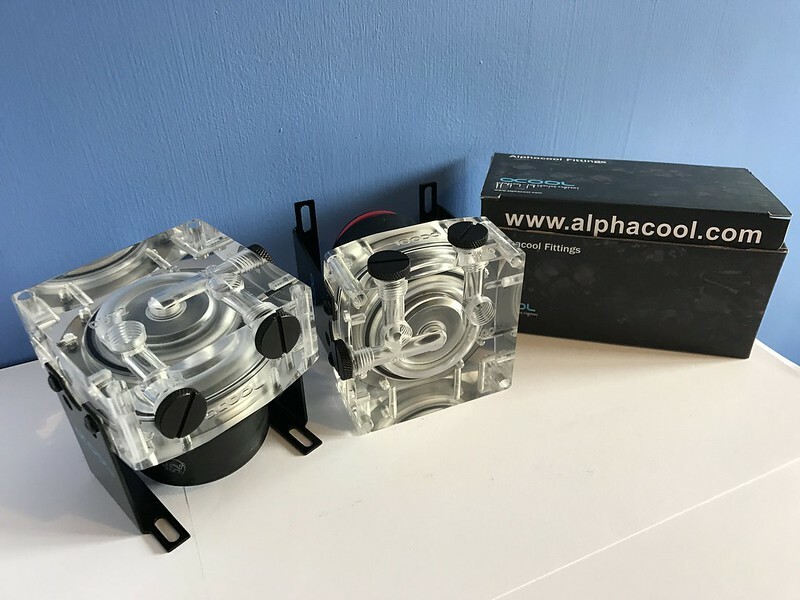 Extra - Alphacool Eisbaer logo kit. 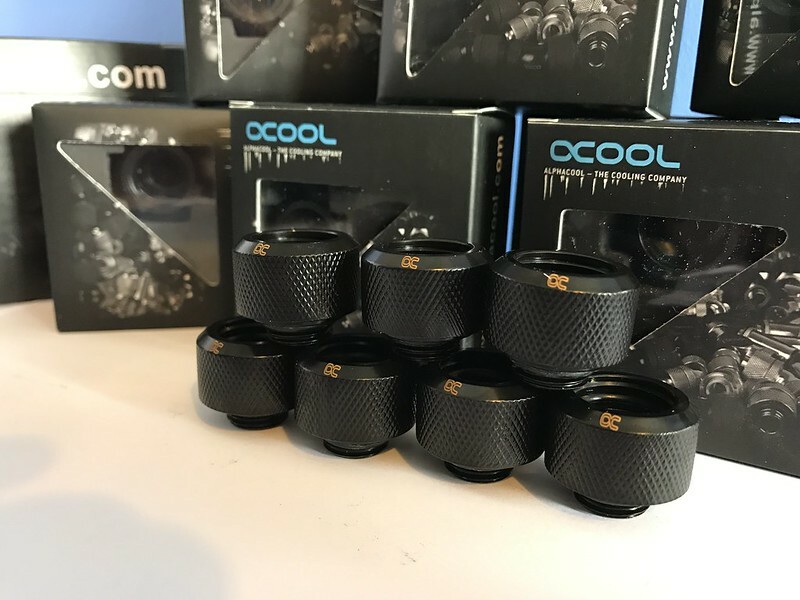 Here are some photos of the products. 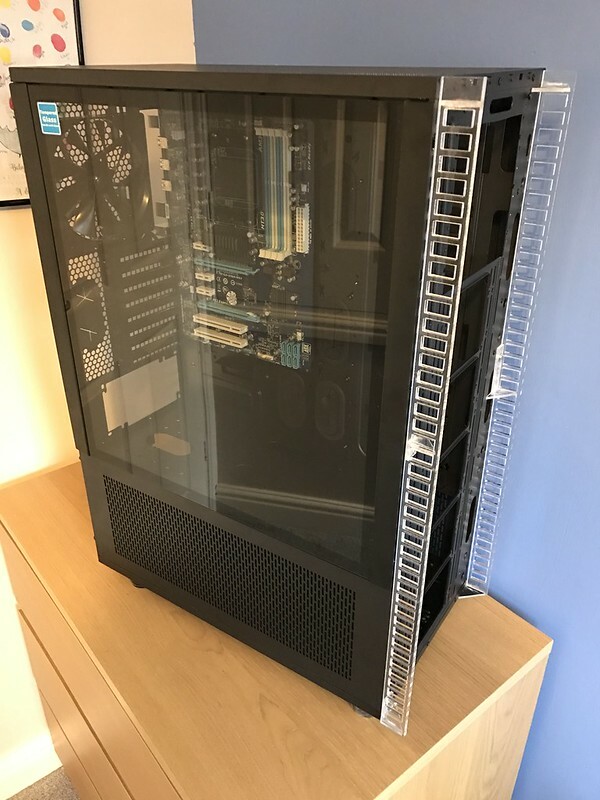 The next up should be a big one with lots of case modding and hopefully Tempered front panel. Welcome to the Zoo! ...but why no avatar? I thought I had I will see what has happen. 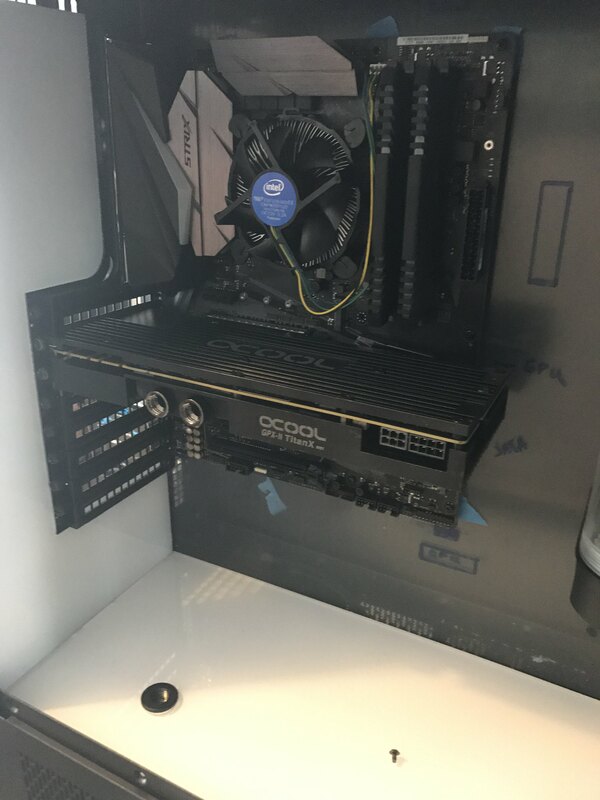 I can not believe how much room is in this case. 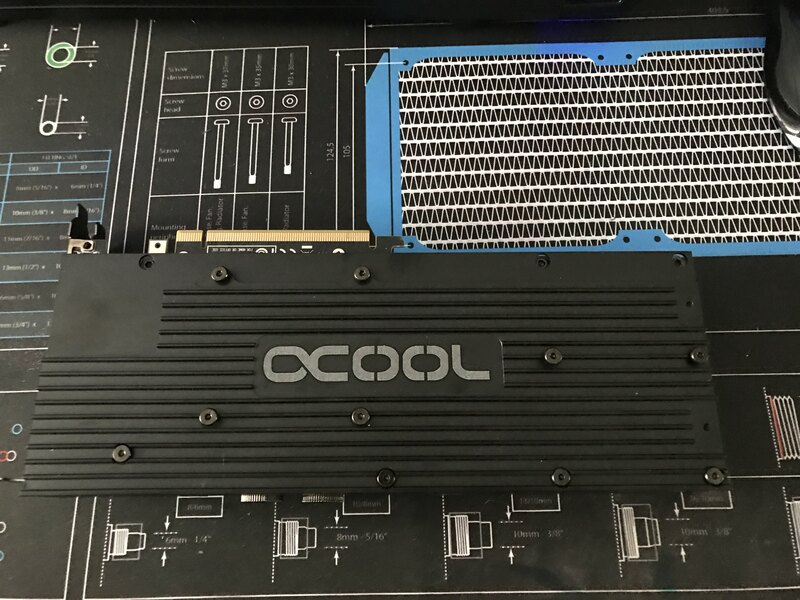 I have added a old motherboard to measure up for the new motherboard tray I will be putting in to the case. 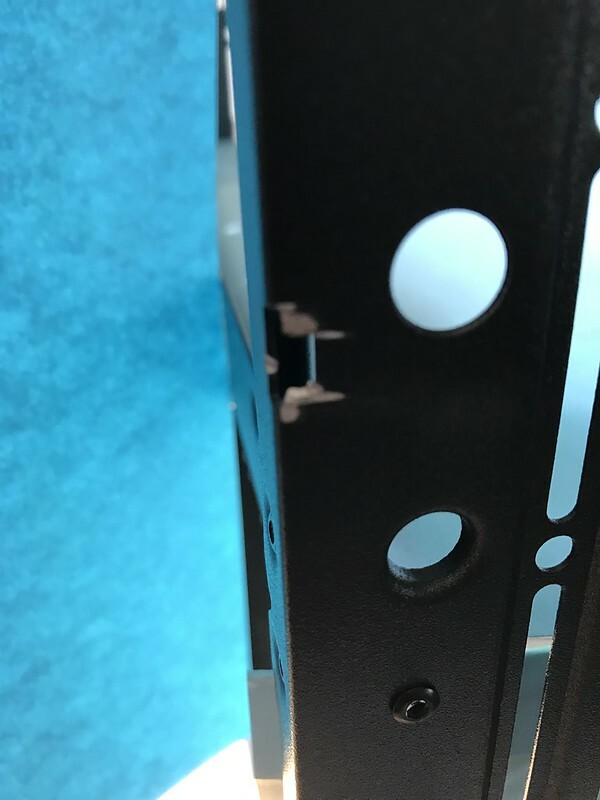 I need to cut of these little tabs off so I can start work on the new custom front. 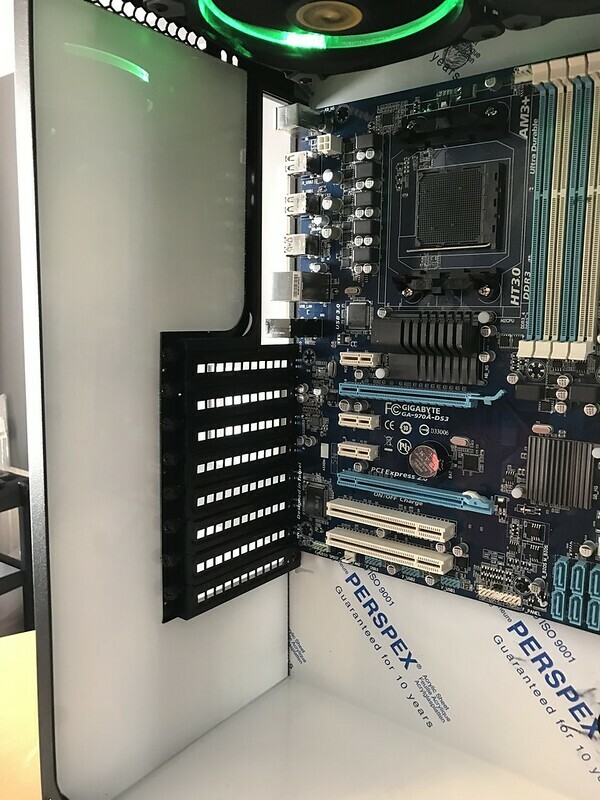 I need to drill out all the rivets on the back and top of the case so I can add my new motherboard tray I have use 5mm perplex, but need to change to 3mm so I have room for the pass through. 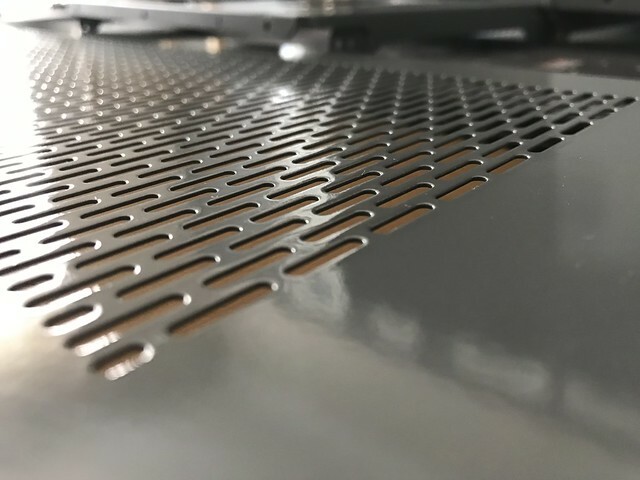 I have added a custom mid plate 5mm perplex this is only going to be used if I can not complete the custom res. 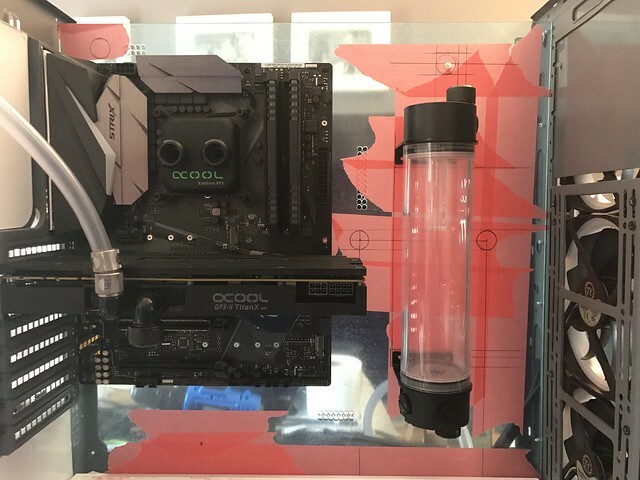 Custom air in takes for the front of the case. Don't look to bad for version one. 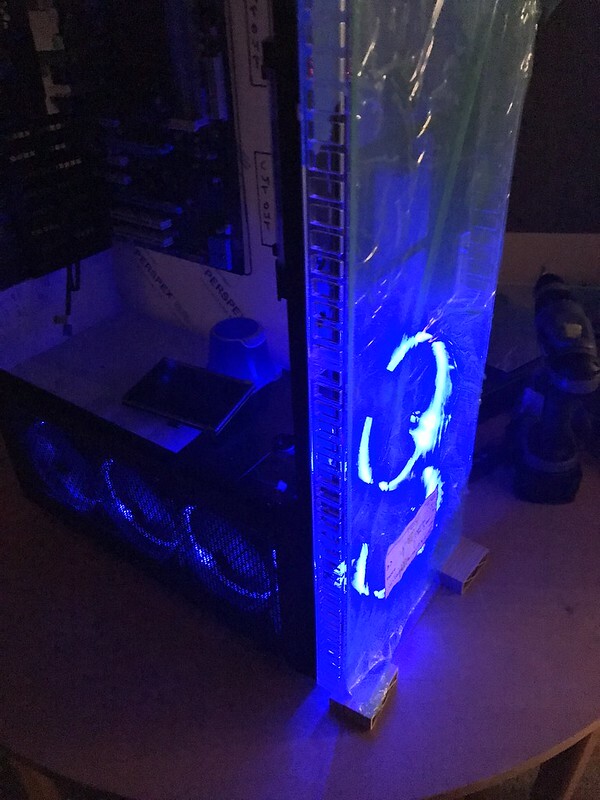 Added the tempered glass and a blue LED fan. Think it needs to be painted black. 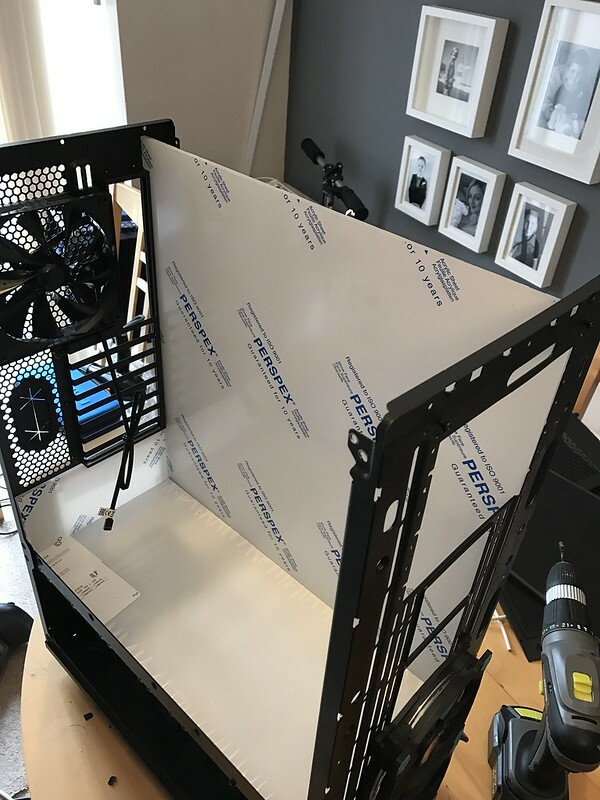 Build starting to take shape. 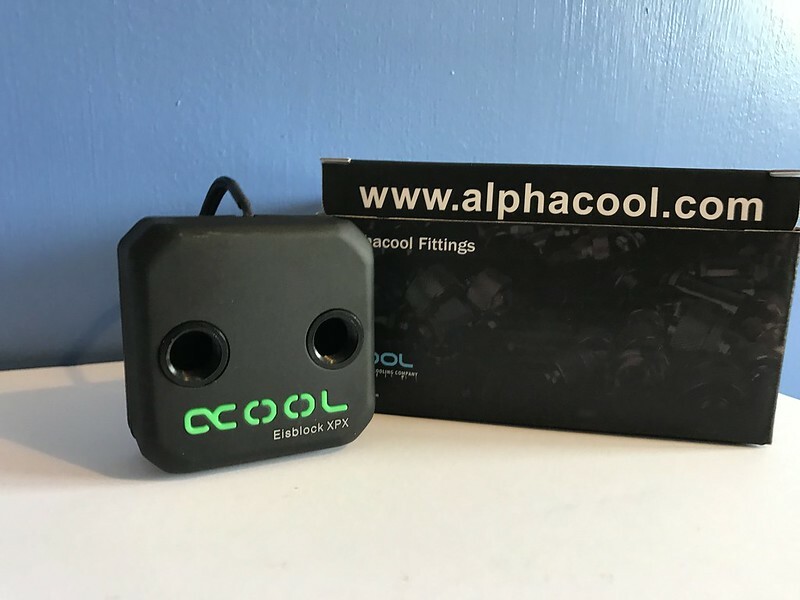 I need to change the way I have mounted the air intake have a few ideas. 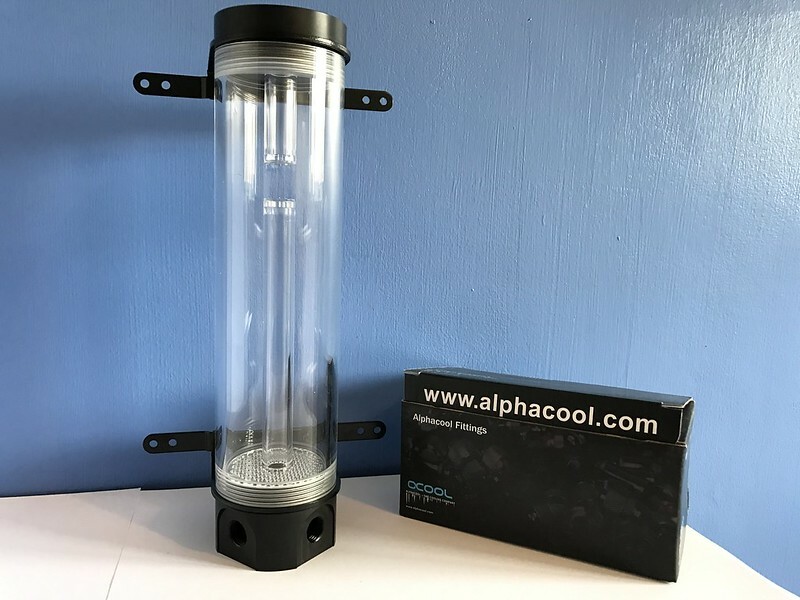 Going to start on the basement add both pumps and my new power switch and sleeve all cable black, should get this done Monday. If you have any feedback or question just post below. 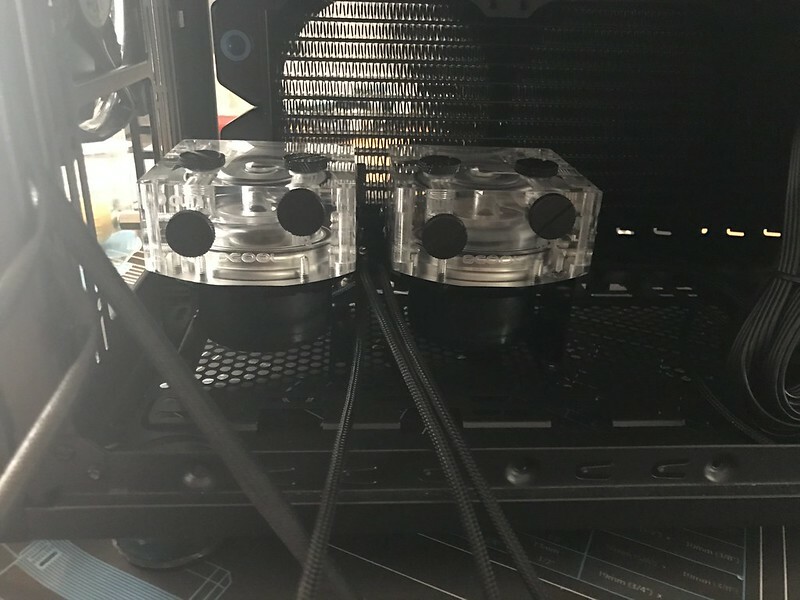 Hi Guy's here is a small update. 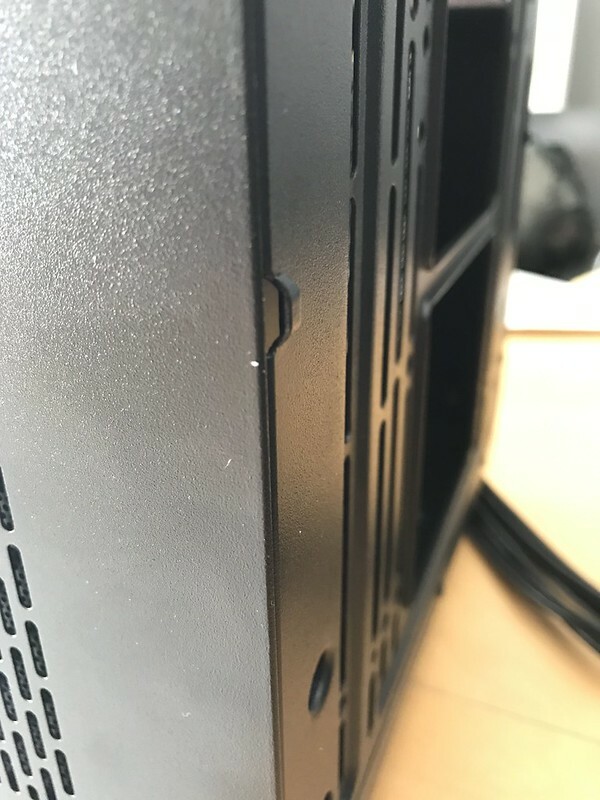 I have added a hidden power button under my case near the front left leg. 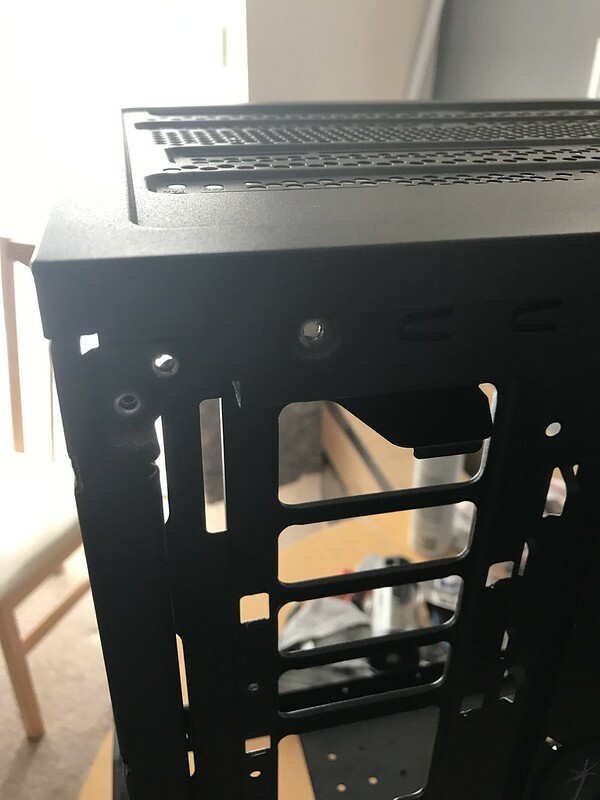 Its dead simple to do I just drilled the hole and drop it in I had some older power switch from a corsair build I did before xmas and just cut it down to size and sleeved it black. I have added some photos below. 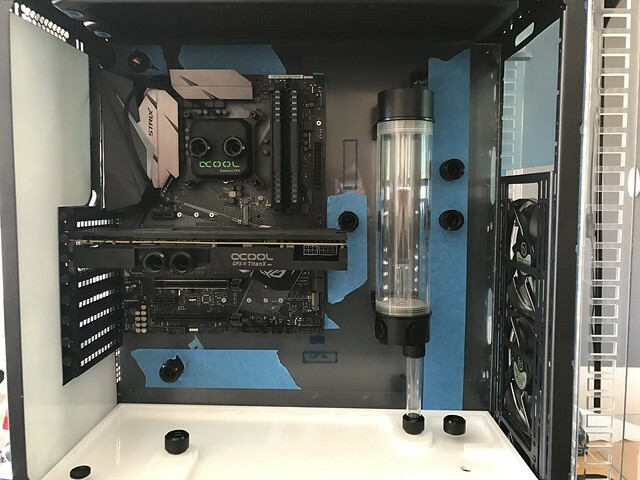 I have turned the pump tops around so all the cables go out to the back of my case and sleeve them black I have a few photos below but once I am happy and made the partition I will make sure I take more photos so you can see where everything is placed and why. Like I said just a small update will have more for you at the weekend. 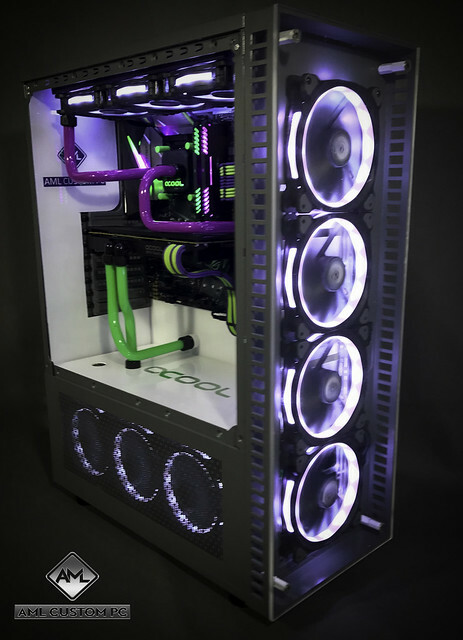 I want to welcome a new sponsor to this project Nanoxia, They are going to supply the fluids to this build I am getting Opaque Green UV and the have mix me a custom Opaque purple these and going to pop. 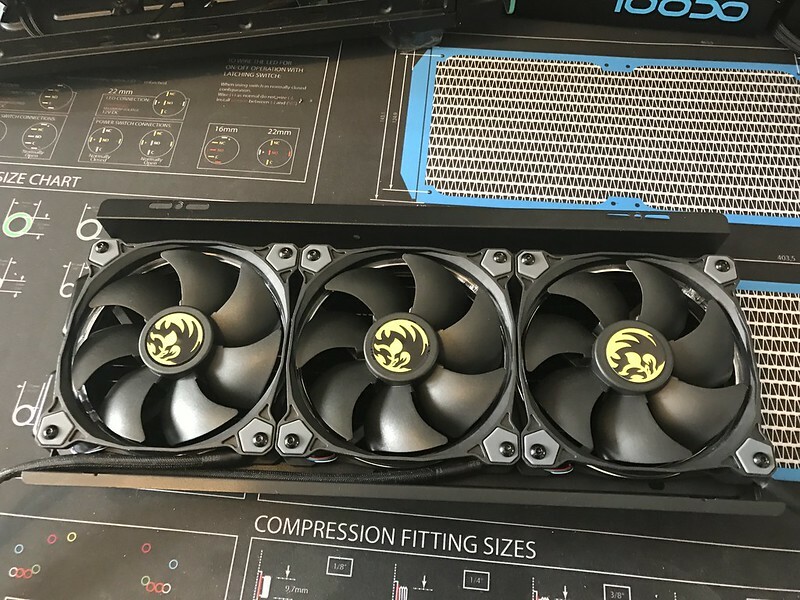 Last weekend I added the fans to rads to check spacing, cable route and watercooling loop for the basement and added my drain port to the pump(photos below). 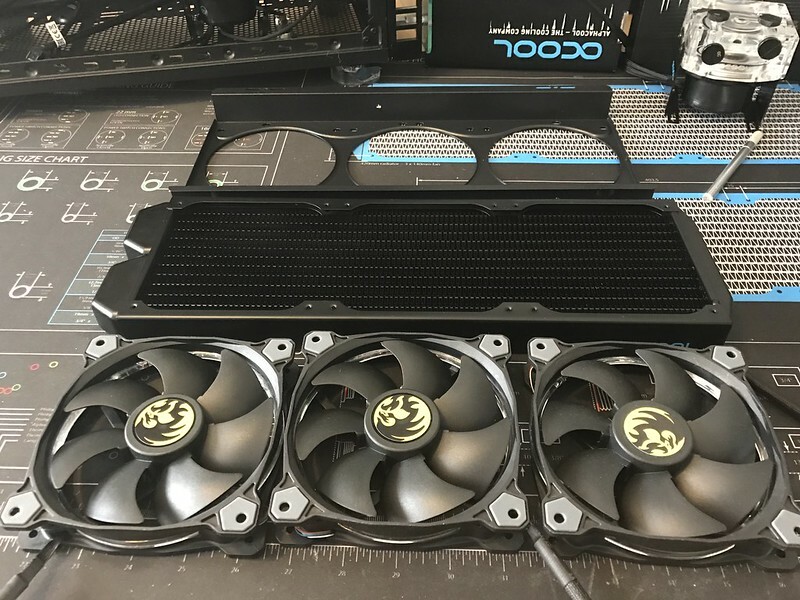 I redone the front fan intakes made them 10mm wider because I was having issues with the way the tempered glass was sitting on the old ones. I ran out of perplex to finish the front off but you can see how far I have got(photos below). 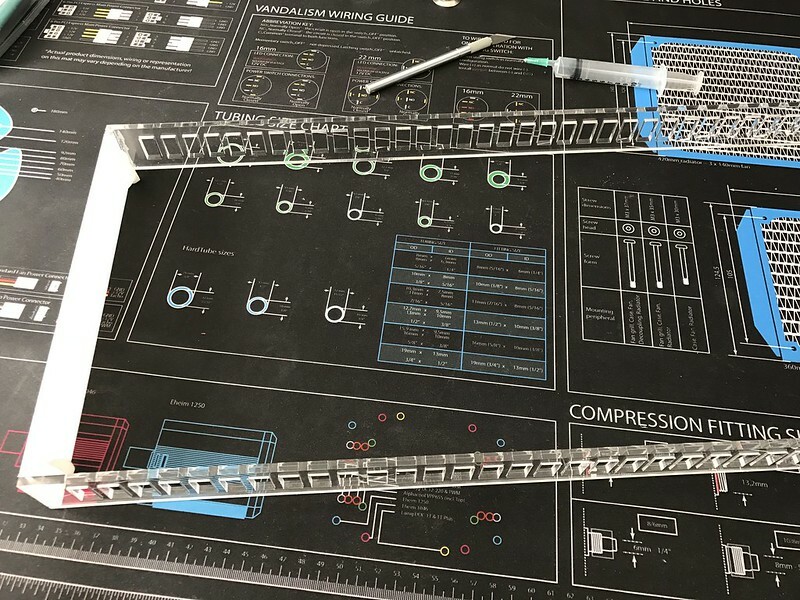 With me doing a custom res in the mid plate, I have had to re do the motherboard tray as I added holes for the pass throughs which are not going to line up with the new res. 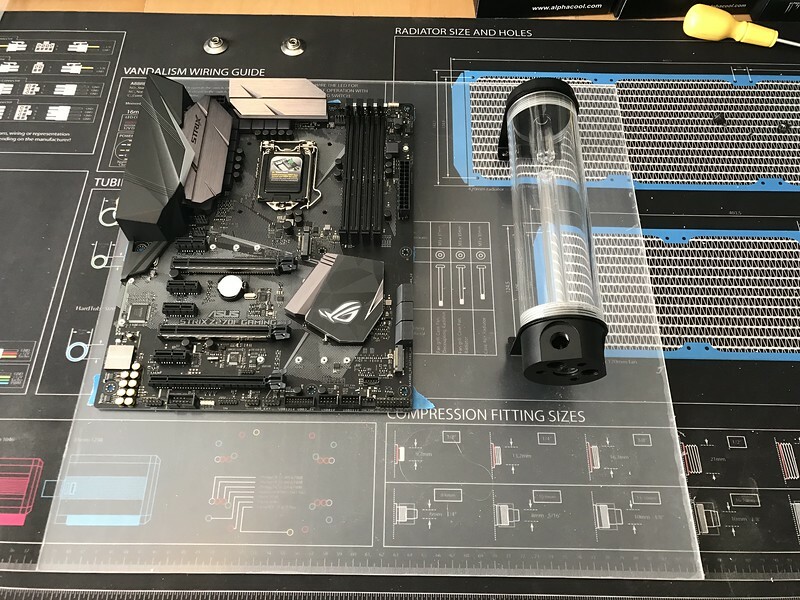 I have drawing a loop on the back of the motherboard tray to make sure I had room for the fitting and to check that I can run my cables. I have place the motherboard and res on to the perplex to mark out all the holes and where I need to run the cables. 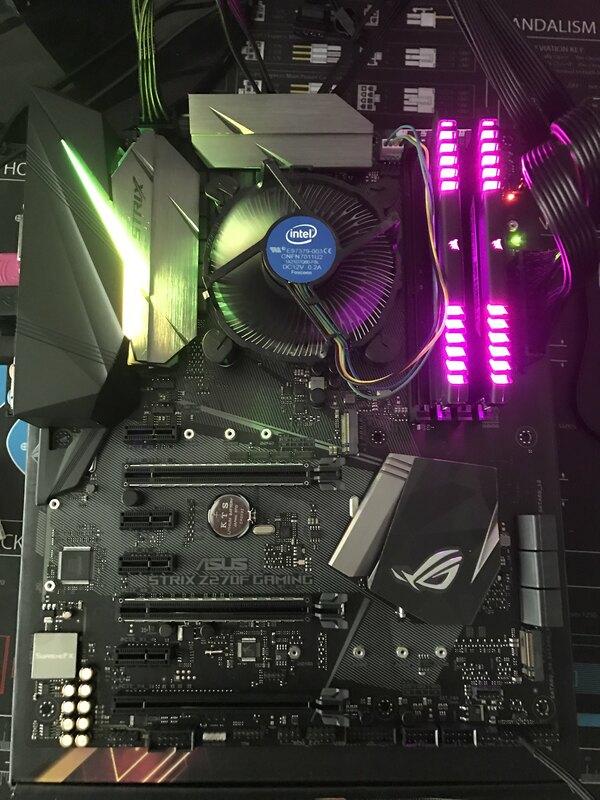 I also added the motherboard stand off. 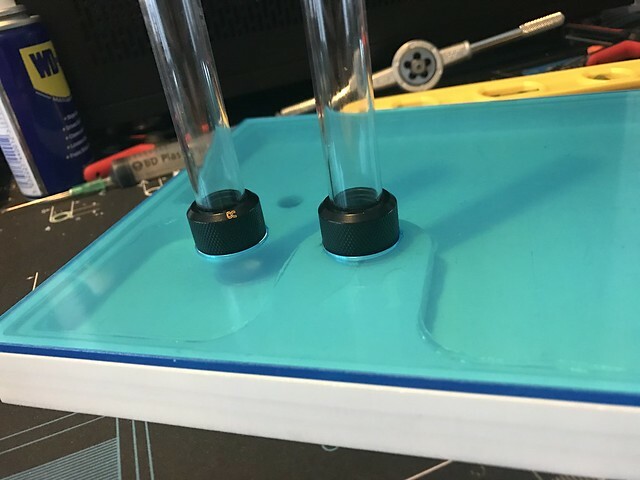 Once I get the fluid I will post some photos of the colours. 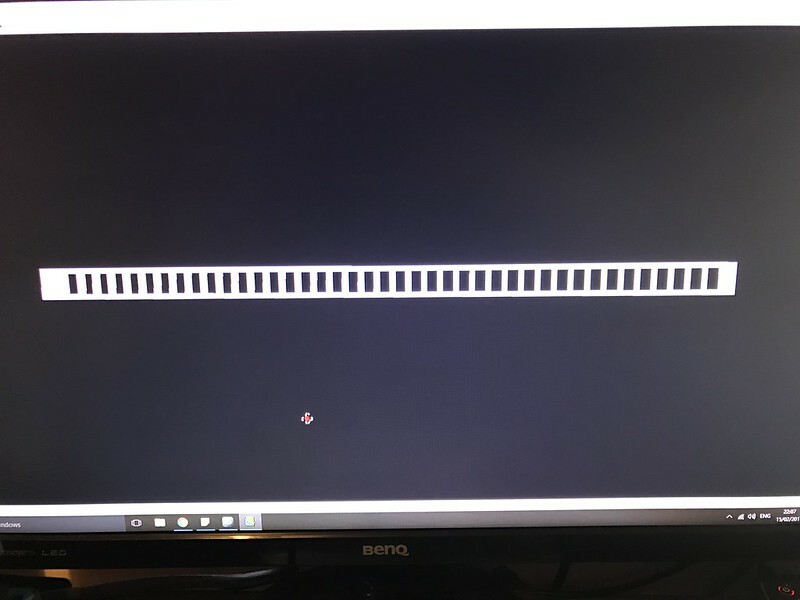 I do need some help I am not sure if I should go hard tube in the basement or stick to soft, feel free to leave a comment below. 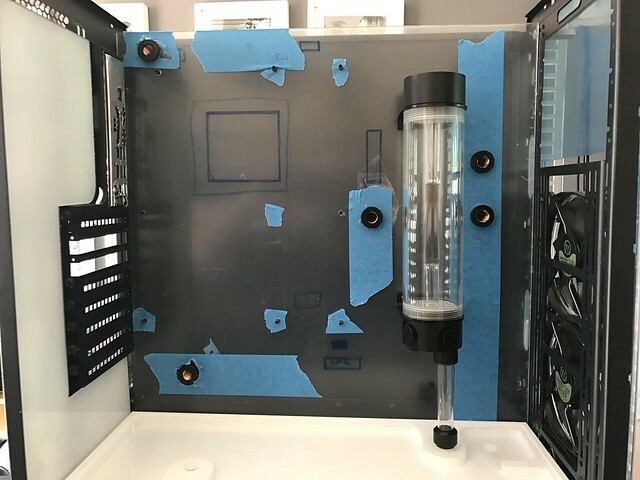 I am hoping to get the custom res back this week and I will do a test fit, I also need to add a pass through from the basement to the back of motherboard tray. 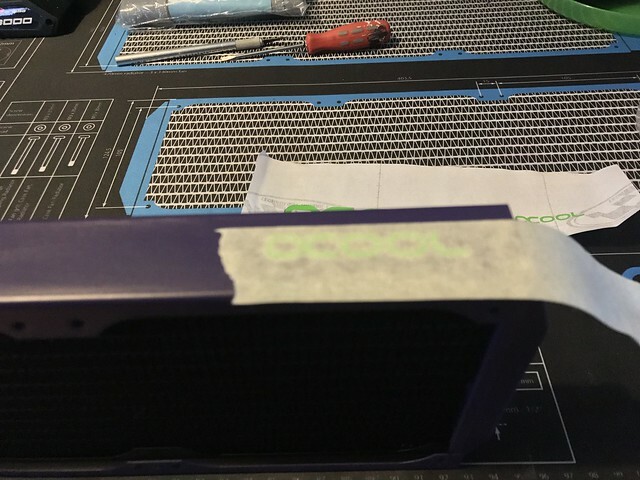 Once this is done the case will be off to paint then the fun starts with all the componets and doing the loop. 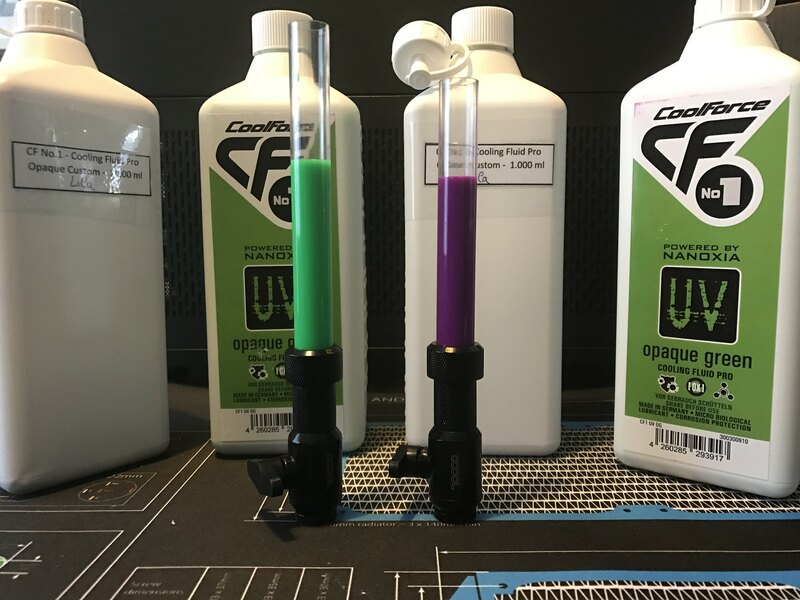 I have got the fluid from Nanoxia it looks great, I got the UV green and they did me a custom purple colour I have some photos below. 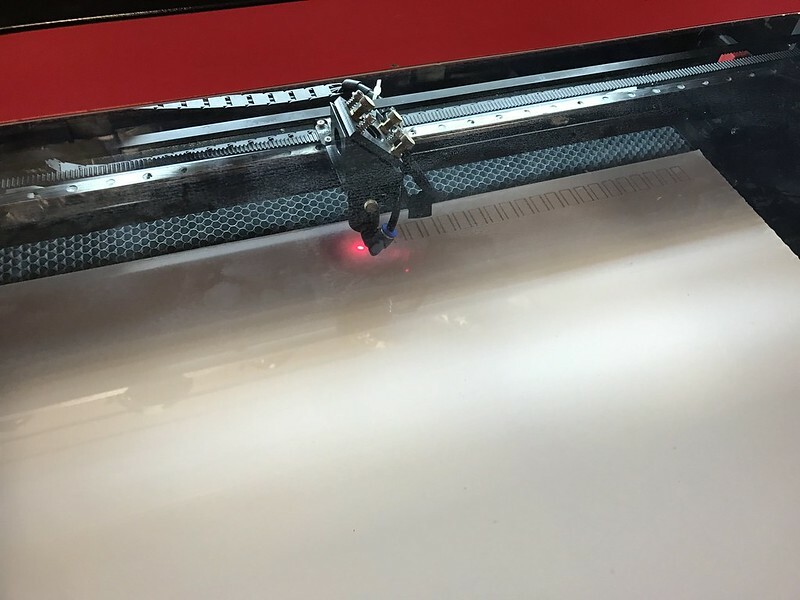 I had some bad news this week having a issues with the custom res so I have made a new simple design this weekend and hopefully it will be cut in the next few days I have found this hard as I am using a friends CNC. 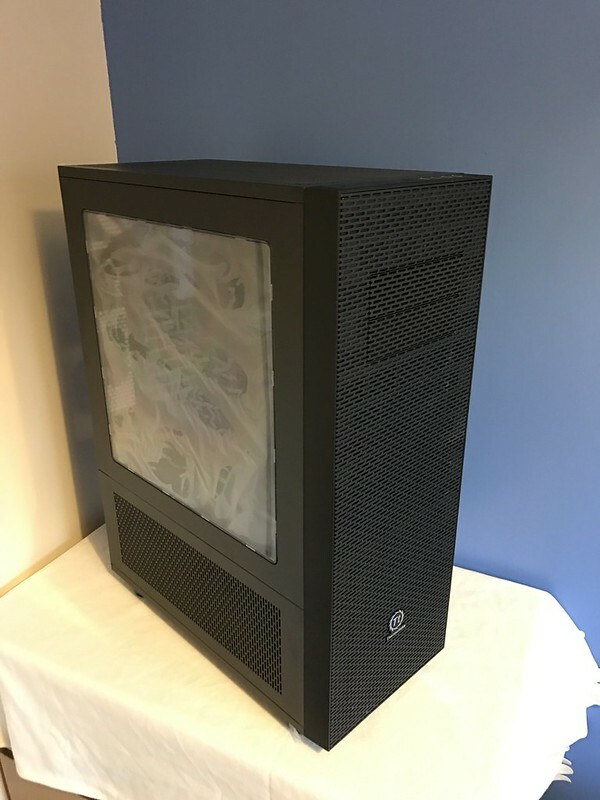 I am looking at getting one myself which will help for future builds. 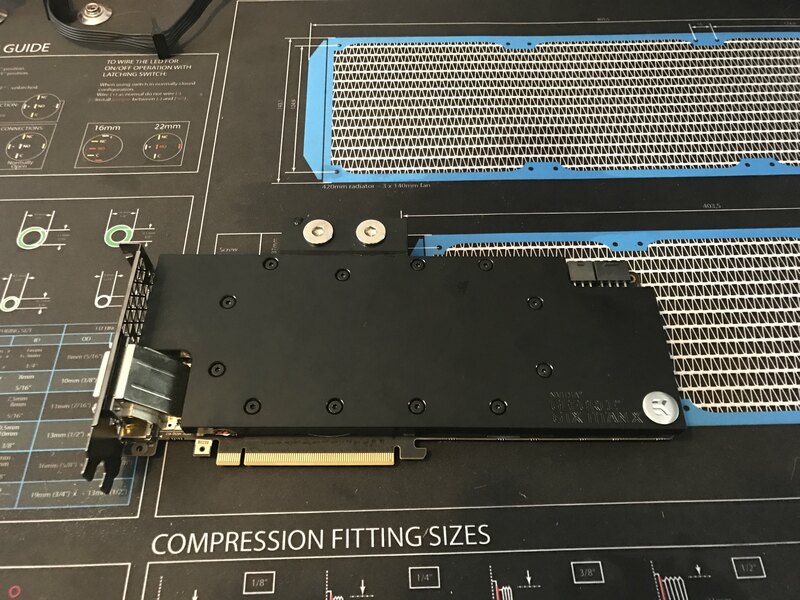 I have took the ek waterblock off the 980ti and put the Alphacool Nexxos 980ti block on, this was so simple to do (one of the easiest installs ever)and the instruction are very simple to follow and all the thermal pads already cut to size I have added some photos below. 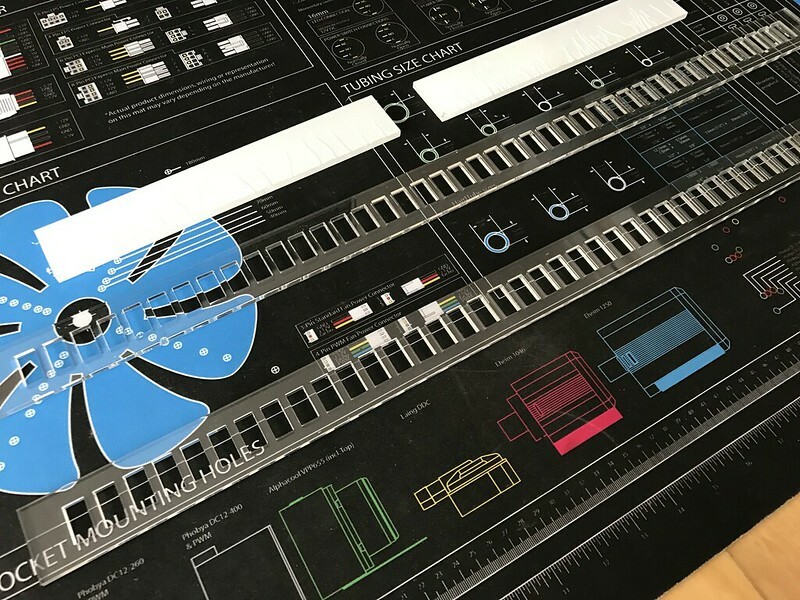 I ended the day putting window 10 on the system. 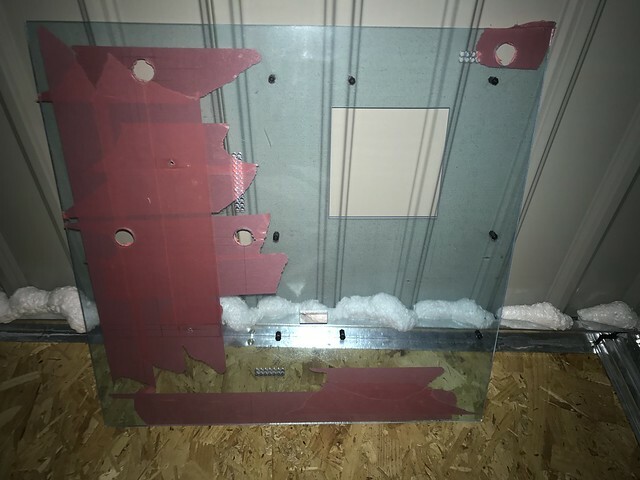 Next update I am hoping for a big one, have a few more bits of perplex to cut and paint then one more pass through hole from the basement to the top rad then it’s off to paint. 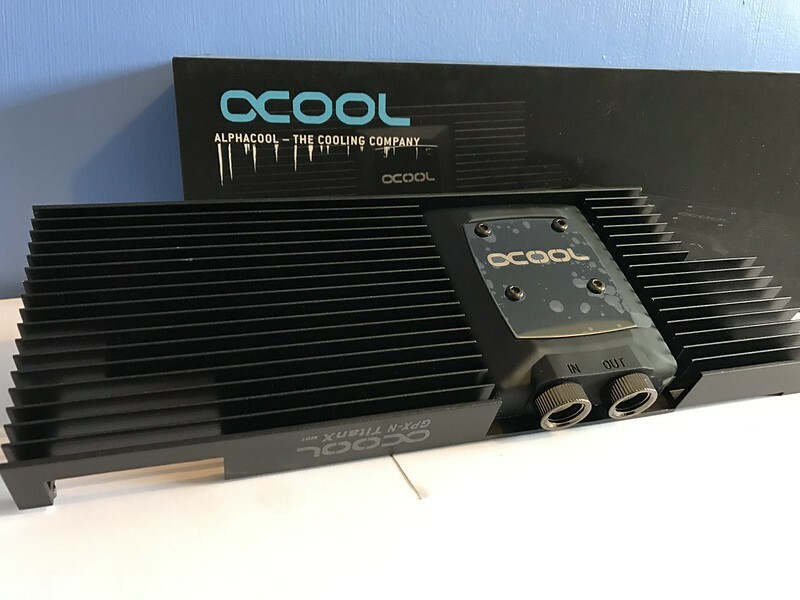 Thanks for checking out my build log any question or feedback leave below. Sorry for lack of updates it has taken a lot longer to do the custom res, than first planned. 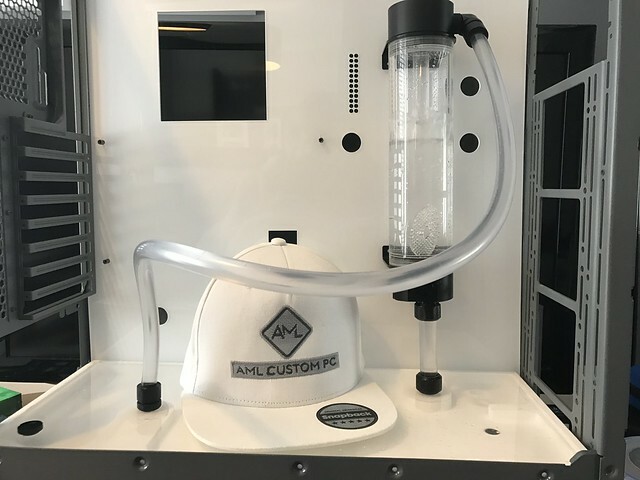 I will start this update with the custom res, the amount of time I have sat and taken measurements to designed the res then for us (paul a friend with a CNC) to produce it has been crazy. 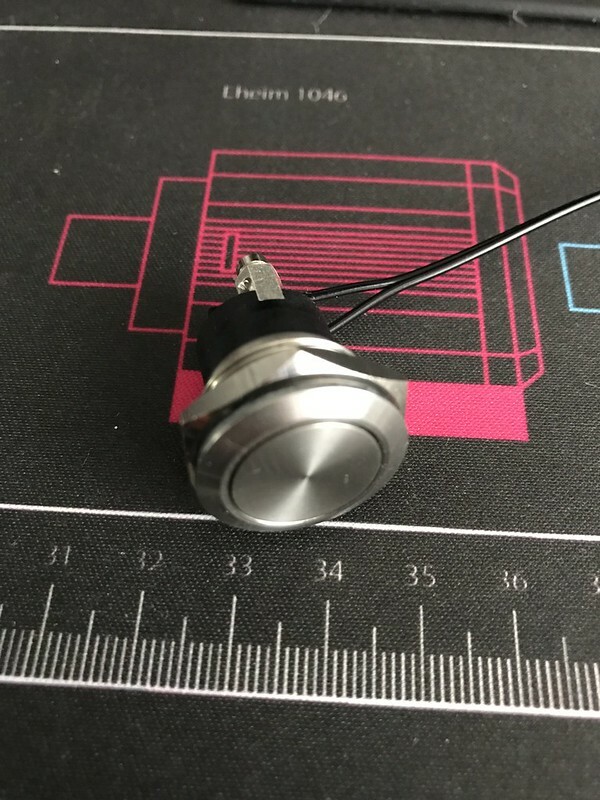 I have attached the finish res below, end up with a basic design one input, one output and a fill port, I have also included two passthroughs. 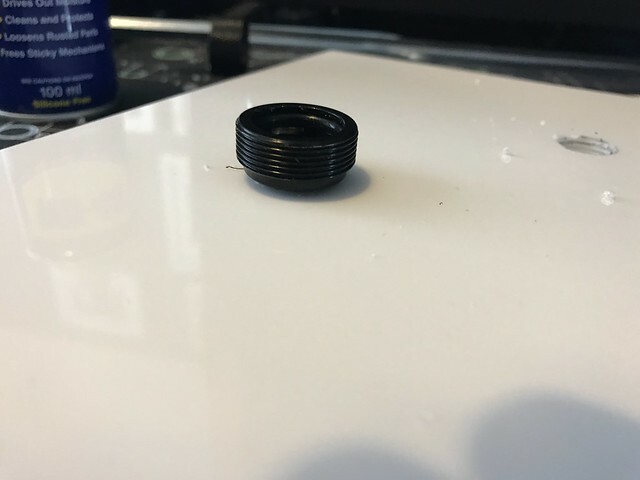 I have done the base of the res in white perplex 20mm thick. 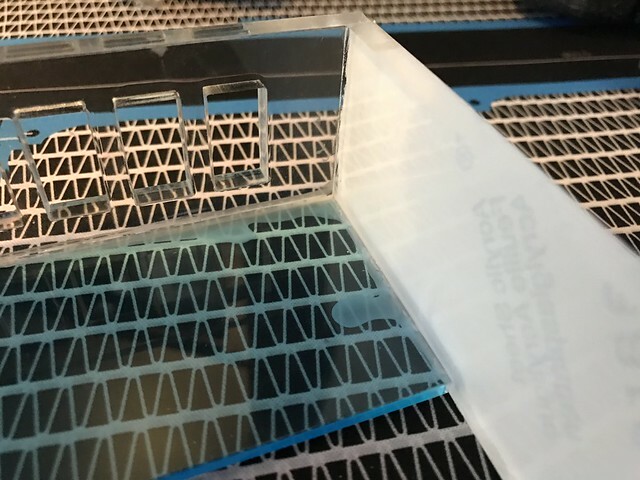 The lid of the perplex is made out of 5mm perplex this should be fine as it is lying flat. 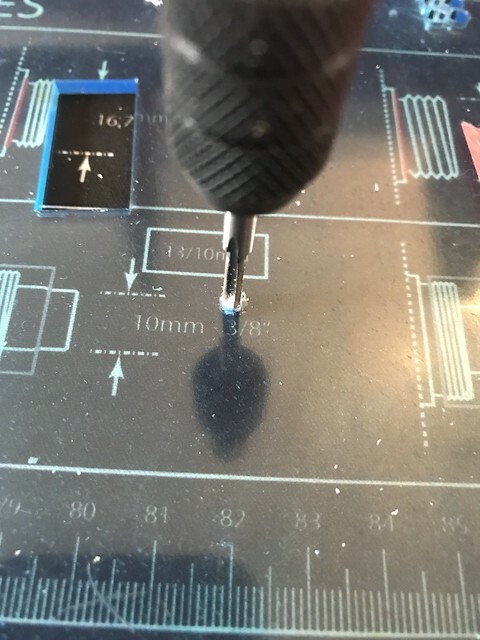 I have also tap the threads for each hole, I need to make sure I did this right as I didn’t want to mess this up as I would need to start again. To seal the lid to the base I used clear silicon around the passthroughs as I don’t want purple running into the green and a product call fusion 500. I am leaving this to dry for the next few days then I will leak test. 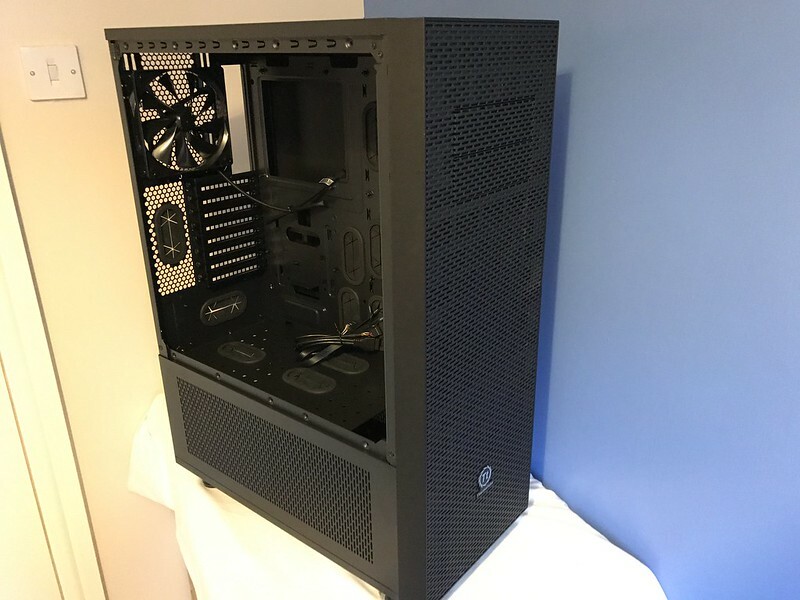 I have got my hands on a used i5 7600k for a great price which I could not turn down. 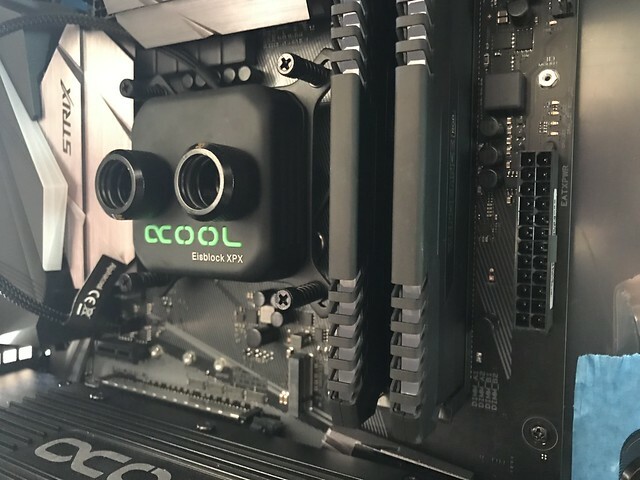 I have also added the Eisblock XPX cpu block to the motherboard, I have attached photos below. 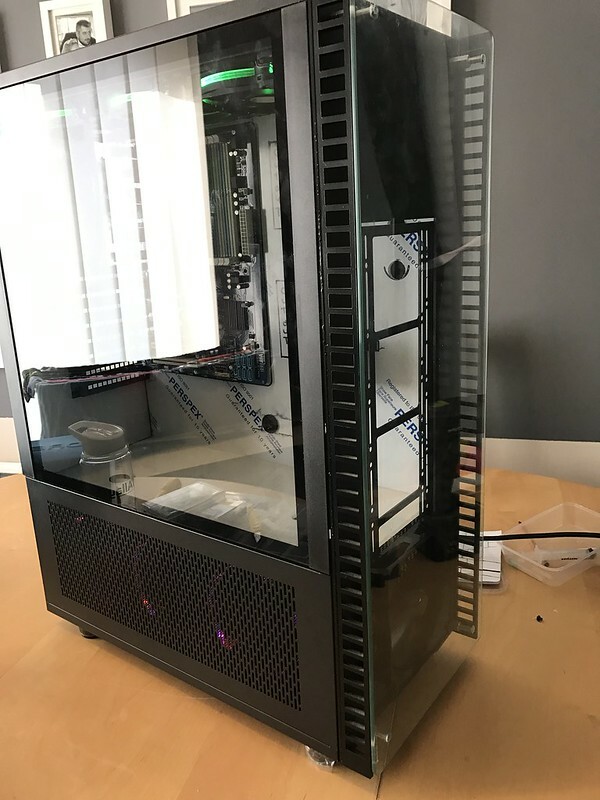 I have fitted the custom air intake on to the front of the case with the tempered glass I really like how much this has changed the look of the case. 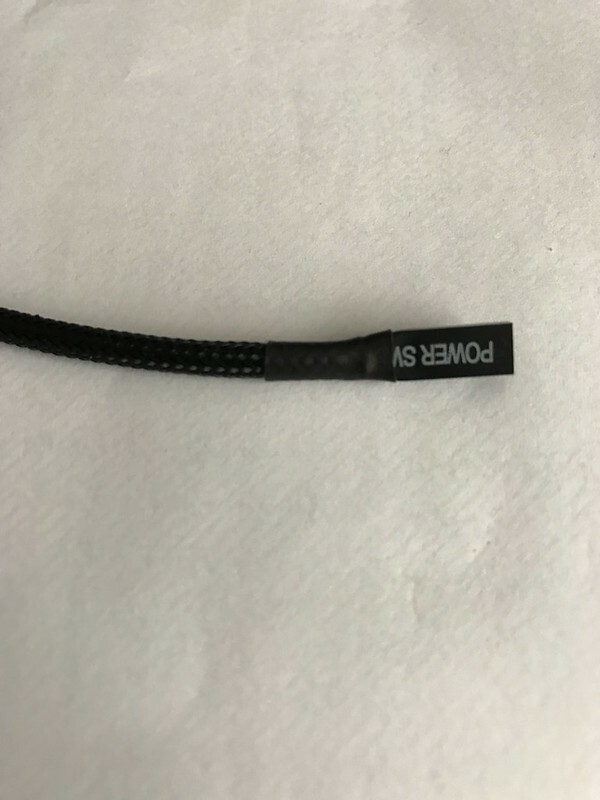 I have attached photos below. 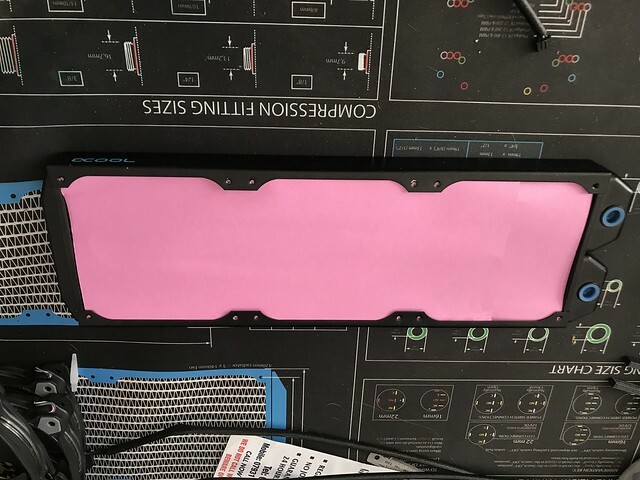 I have drilled all of the holes for the passthrough on the custom motherboard tray, I do need to try and make some spacers as it is going to be tight fit on the back side panel, I have a few ideas. I have attached the photos below. 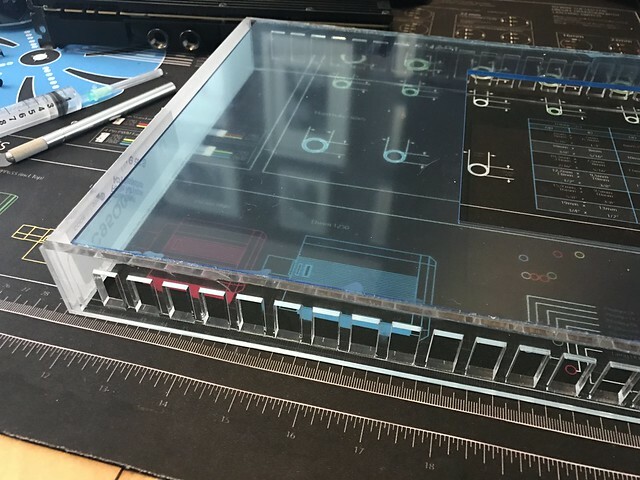 Finished custom motherboard tray need to added holes for 8 pin 24pin. 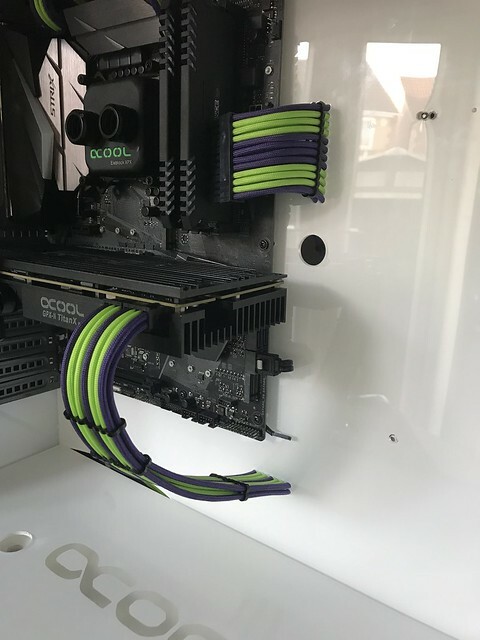 Meet up with to the wire custom sleeves and get the rest of the cables sleeved. Hope you have enjoyed the update, any questions or feedback leave below. 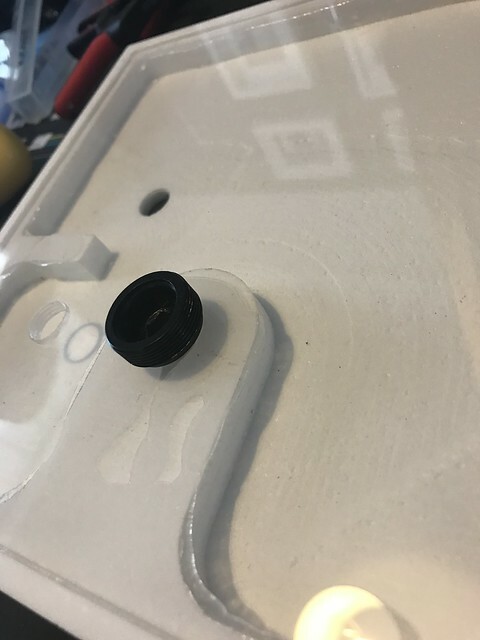 I've had bad experiences with silicone on flat smooth plastic like this. 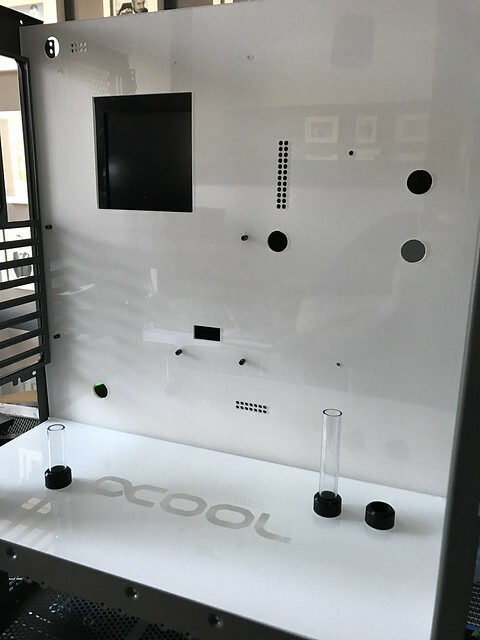 Odds are high that it will pop open when the closed loop heats up. 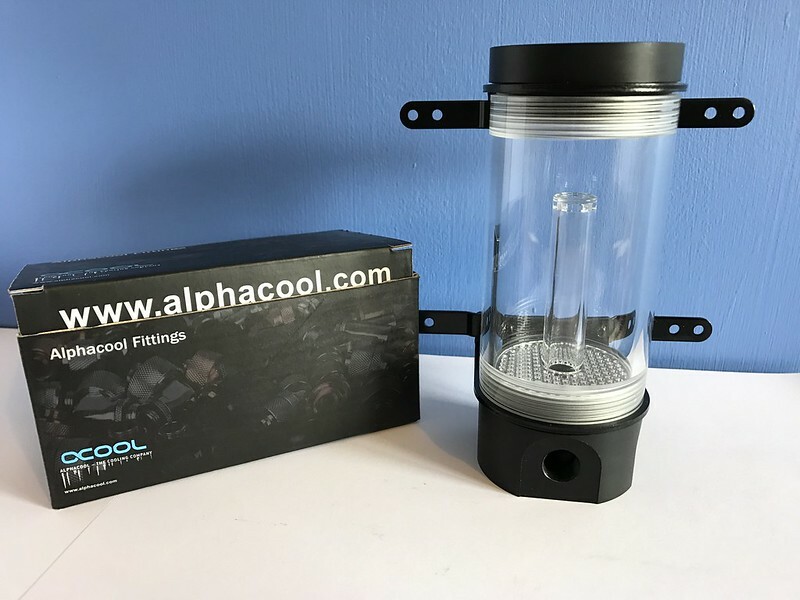 You need an open loop or some kind of pressure relief. 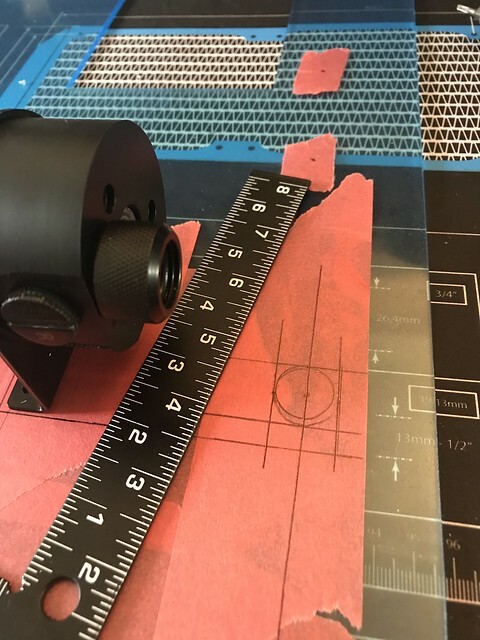 If you have cnc access, you might as well run an O-ring channel and screw pattern. Everything else is great. I'm just scared about the tank. 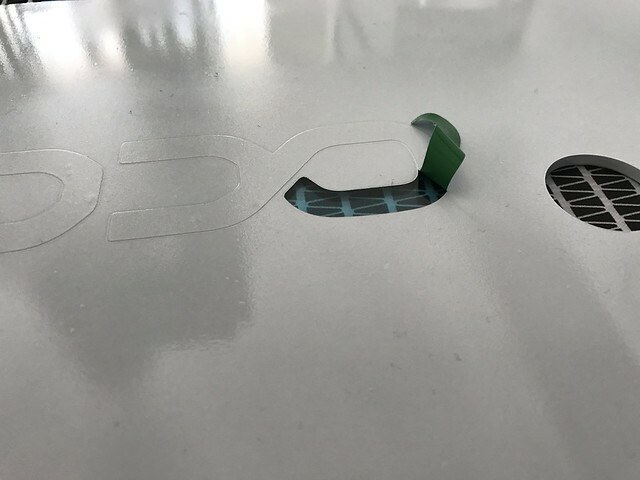 Remember: Silicone is a sealant, not a glue. 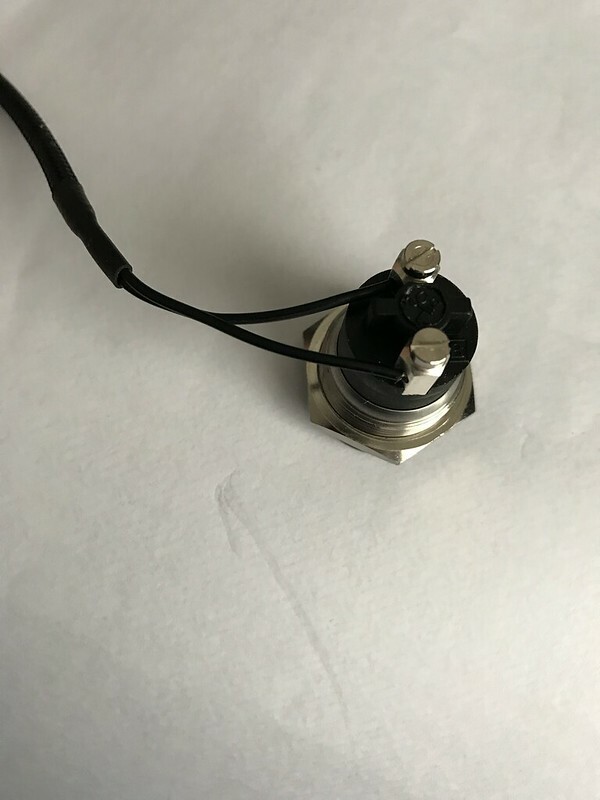 Thanks for the feedback, I have used a perplex weld call fusion 500 to seal the lid to the base. 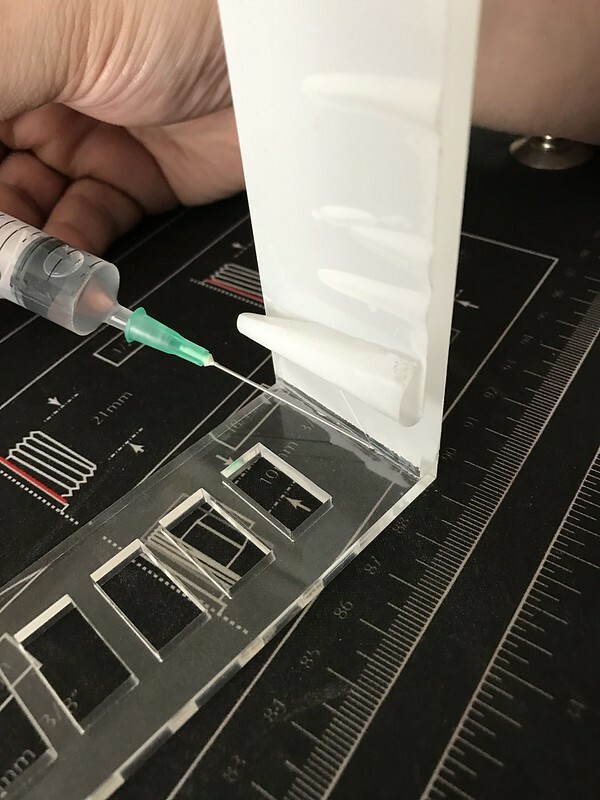 I only used the silicon around the pass through. 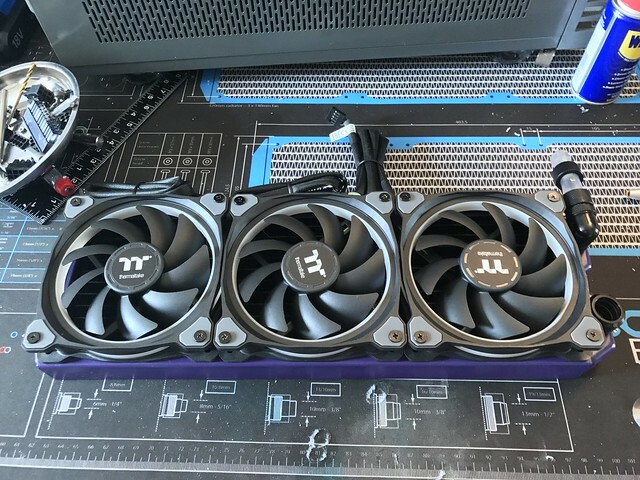 If it leaks I will start again. 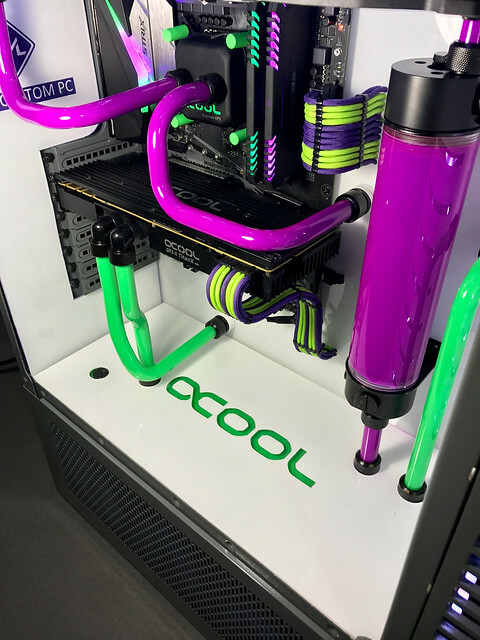 cool update, Thanks again for sharing your build with us! Thanks, hoping to get the next update up shortly the build is almost done. Oops. Missed that. Thank God, though. I've seen some homemade aquarium mishaps too. Hope it works. 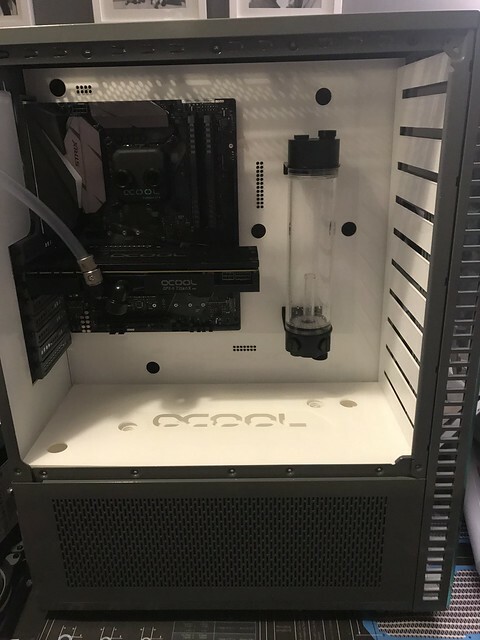 Just a quick update the case is off to paint should hopefully get this back in 10 days. I will not be able to do much while this is getting done. 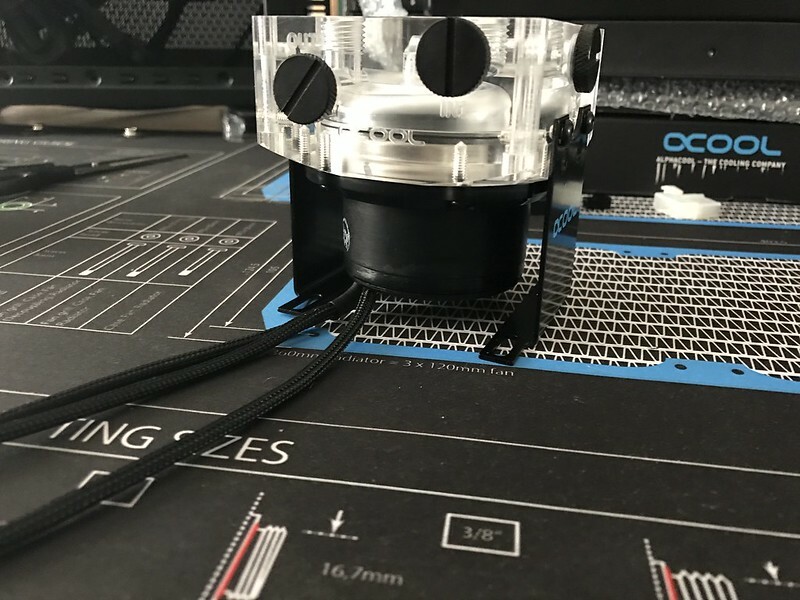 I will post some photos at the weekend of me leak testing the custom res. 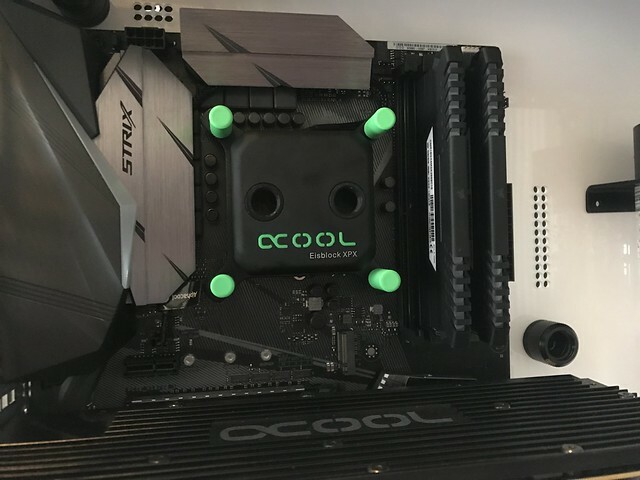 I have been thinking about painting the brackets green for the CPU block, let me know your thoughts. The case is back from the paint shop (one week late) it’s turn out great, I have added a few photos below but I don’t want to show too much just yet. 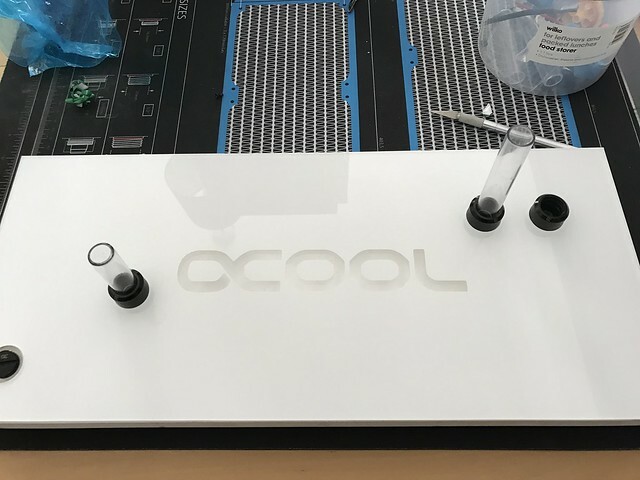 I have done a top cover for the custom res I cut the perplex to size add the holes, I want to put alphacool logo on this, so you can see the nanoxia fluid coming through the logo. 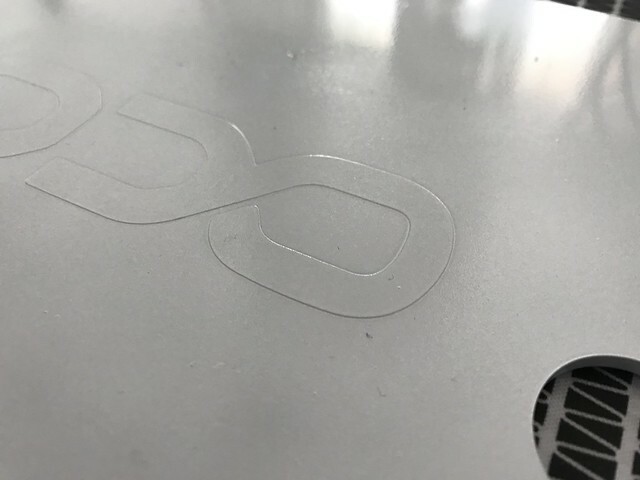 I my friends at gorilla game to cut the logo out onto vinyl, I place this in the centre of back of the perplex then sprayed the back with a high gloss white. Once this was dry I peeled back the vinyl and you can see in the photos below it turned out great. 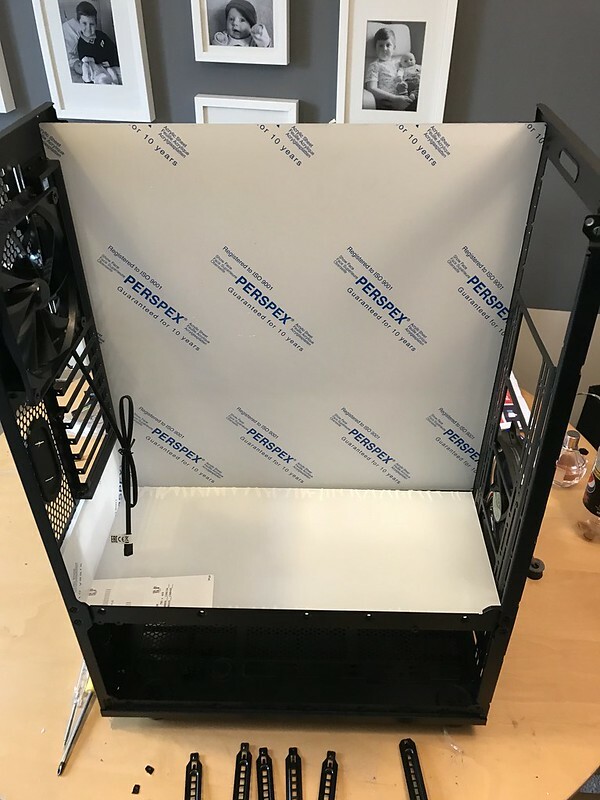 While I had the white gloss out I did the same process for the motherboard tray, I covered the front of the motherboard try in painters tape and paint the back in high white gloss. 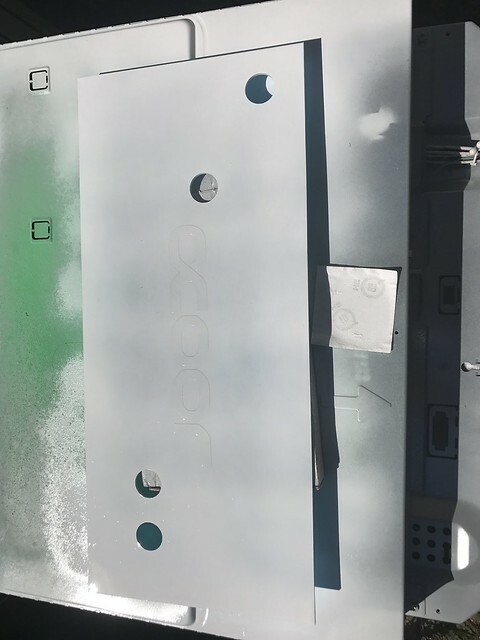 The reason why I paint the back of the perplex is because you get a nice finish when you look from the front, you can see this in the photos below. 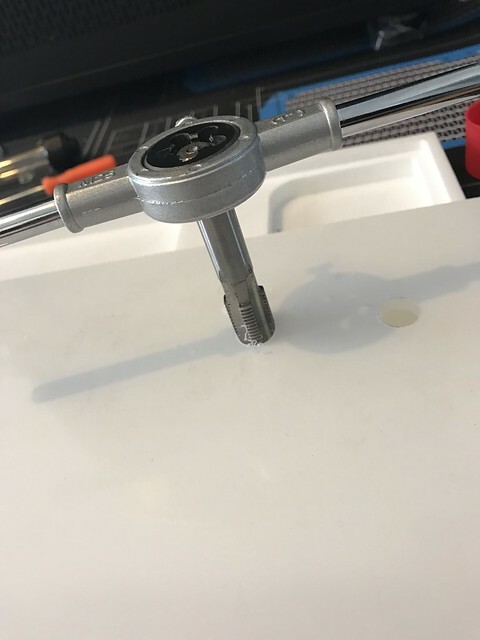 I had to buy a new rivet gun, I have some how misplaced it. 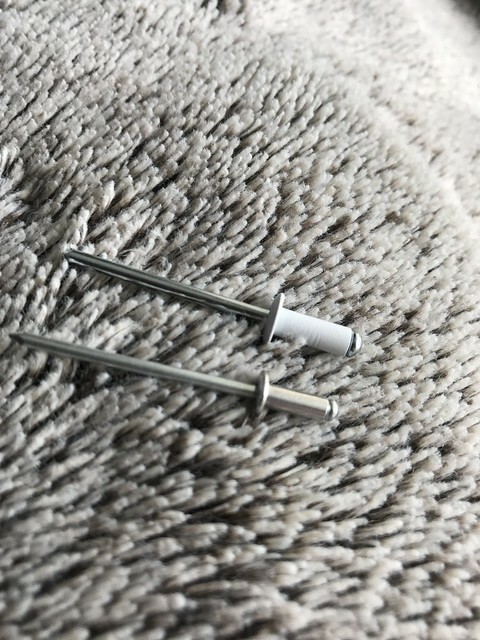 I order some white 3.2mm rivets from ebay they look great (photo below) but were 4mm not 3.2mm so I didn’t use them, which mean I need to paint all the rivets white. 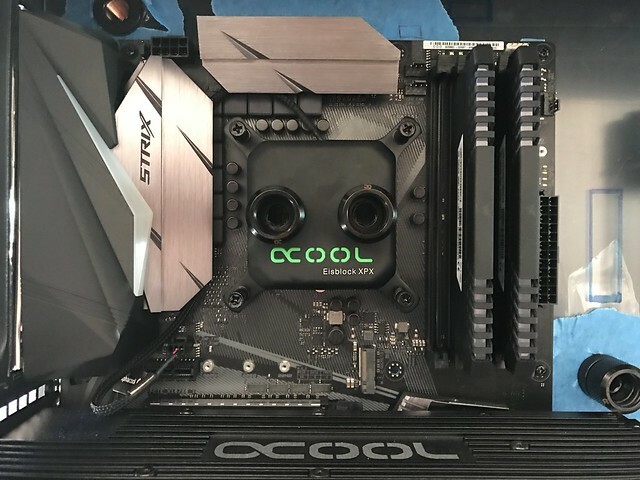 I have been speaking to a few people in the forums who suggested not to paint the full bracket on the CPU block, I have follow their advice and I think it’s came out great. Thanks again for your input, I have attached the photos below. 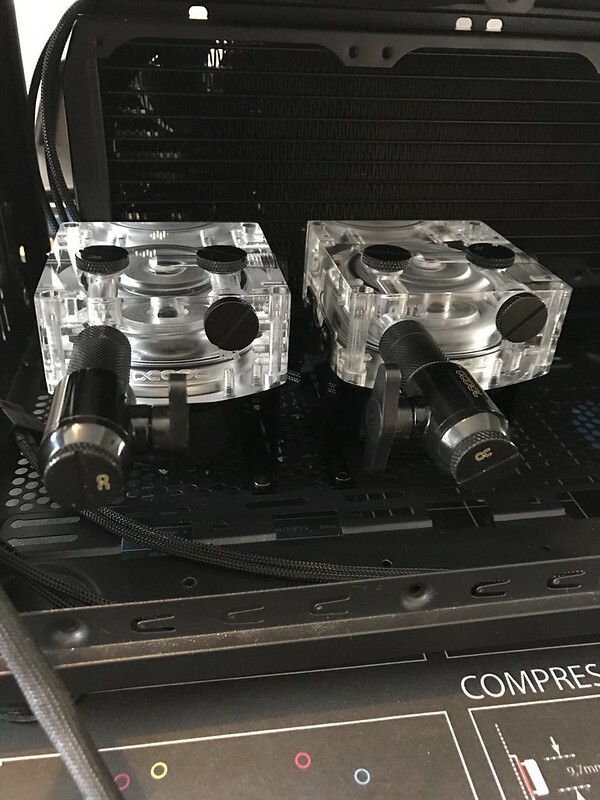 I have also leak test the custom res left it to run for hours and had no issues. 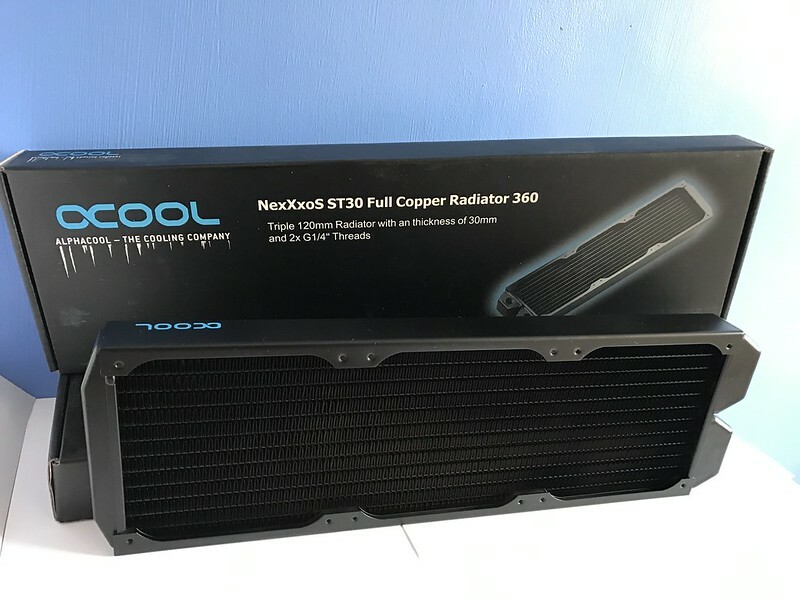 The only thing that I need is the fans which I have been told should be here the end of July. I will be meeting up with to the wire custom sleeved in the next few weeks to get all the cable sleeved and ran. 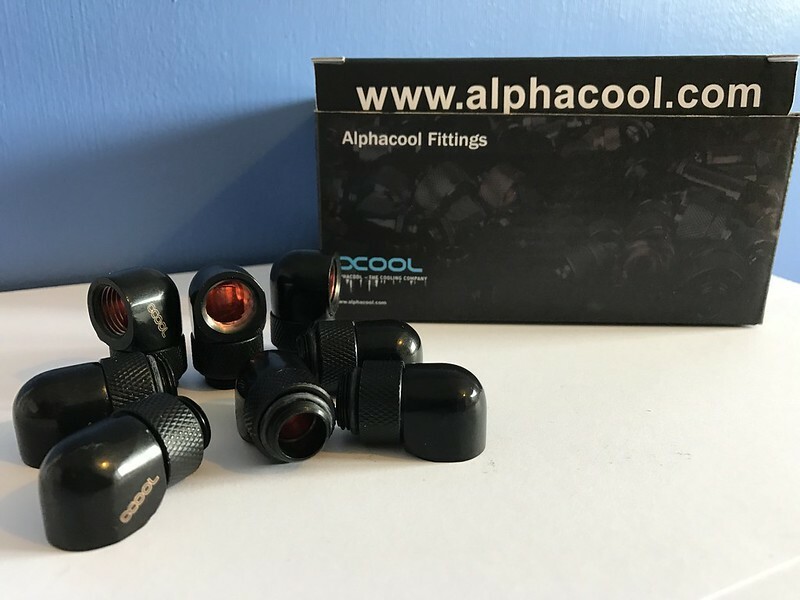 I need to make some custom spacers as the bulk fittings are a little bit to long, I need to think outside the box. 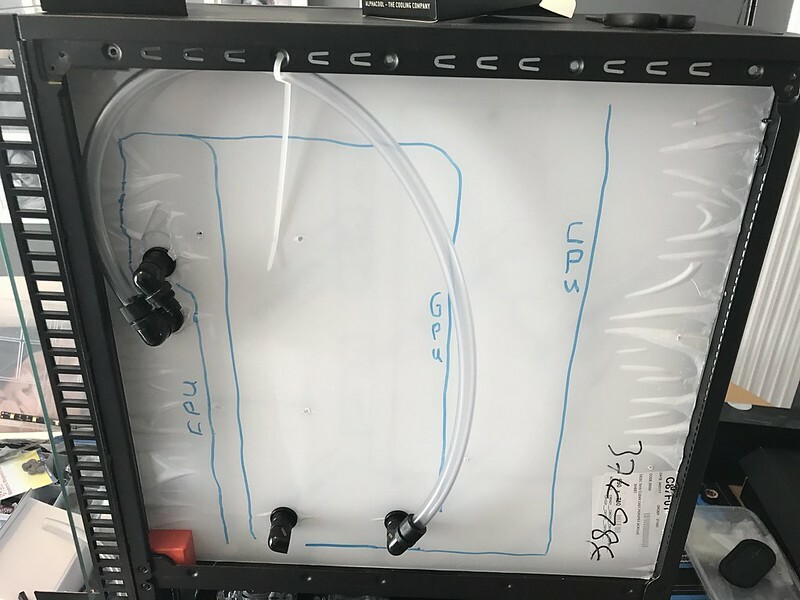 Run soft tubing behind motherboard tray. 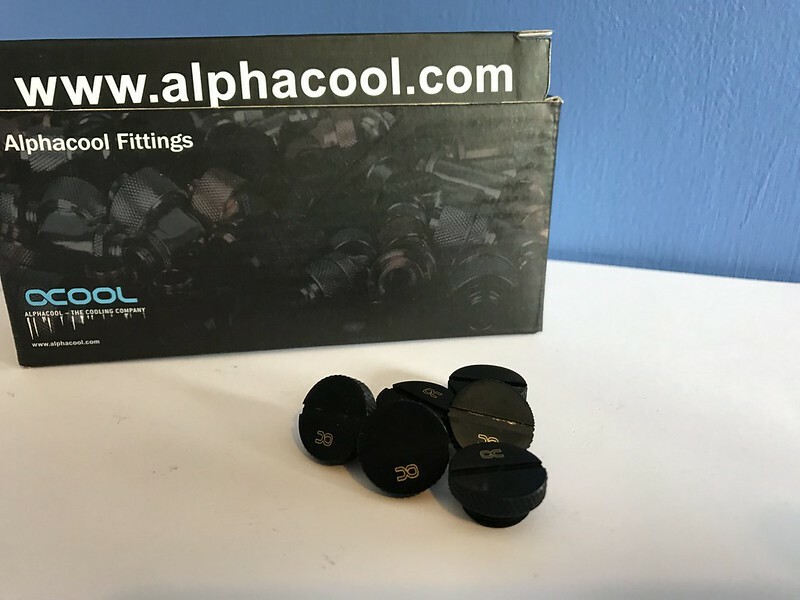 Hope you all enjoy this update, if you have any questions or feedback leave a message below. 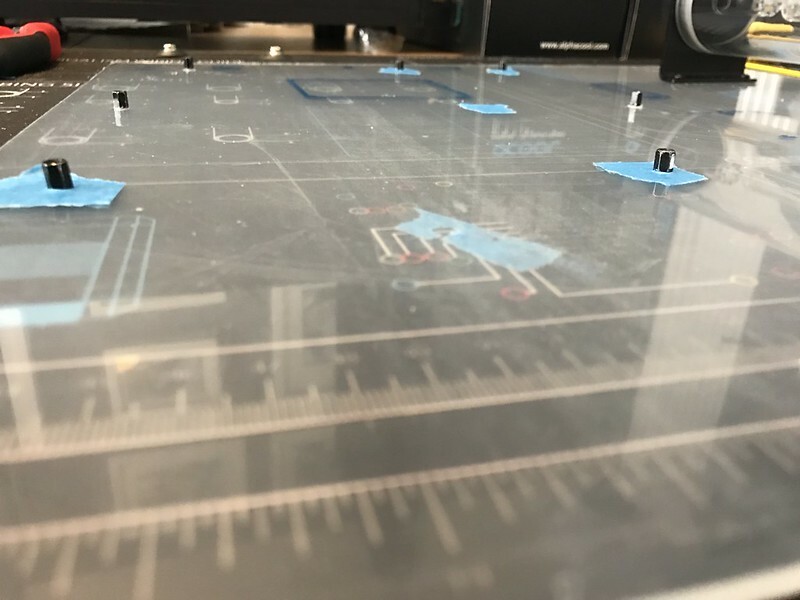 Sorry for the lack of updates, I have been moving in to a new work shop and been having a little dabble at 3d printing. I have bought Anet A8 this will be for my next project. 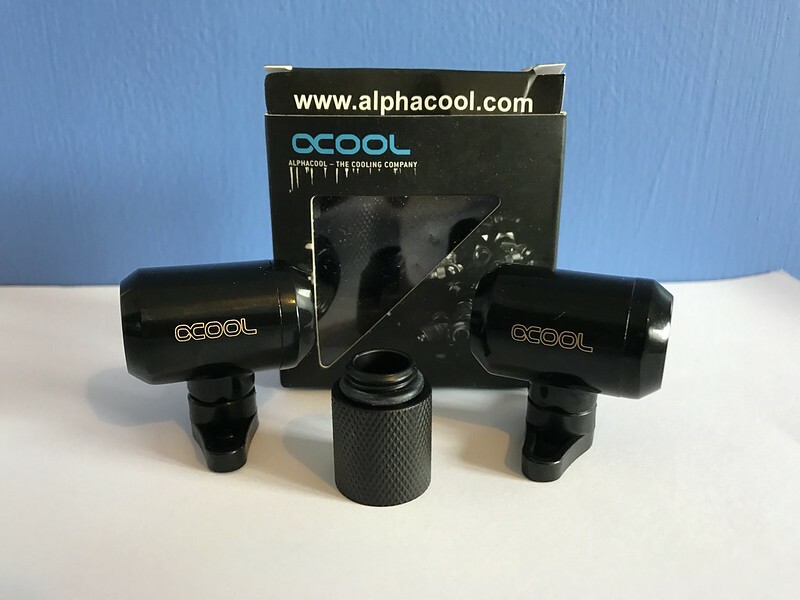 I am still awaiting my last product, if I don’t have this in the next two weeks then that sponsor will miss out and I will get the final photos completed. 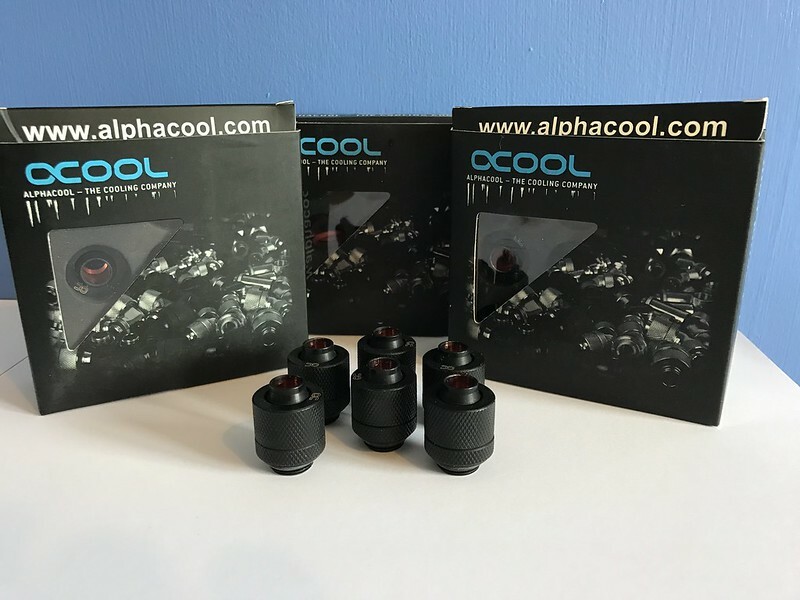 Just want to say a big thank you once again to Alphacool for supplying the watercooling component’s and Nanoxia for the fluid and for supporting both brands have given me. 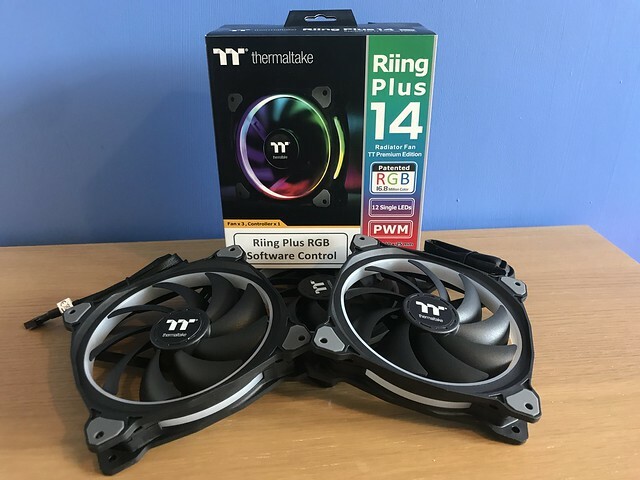 I would like to say a big thank you to thermaltake for sponsoring this build they have supply all the fans. 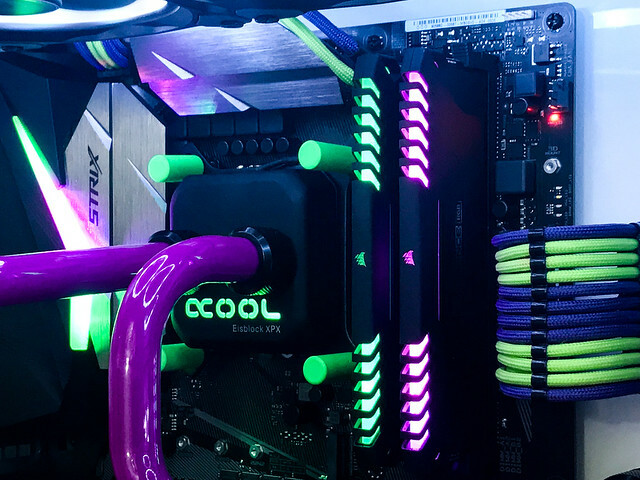 I am not a big fan of RGB but I like how much flexibility you have to get the right colour for the theme plus the riing plus fans look great. Thanks again for your support. 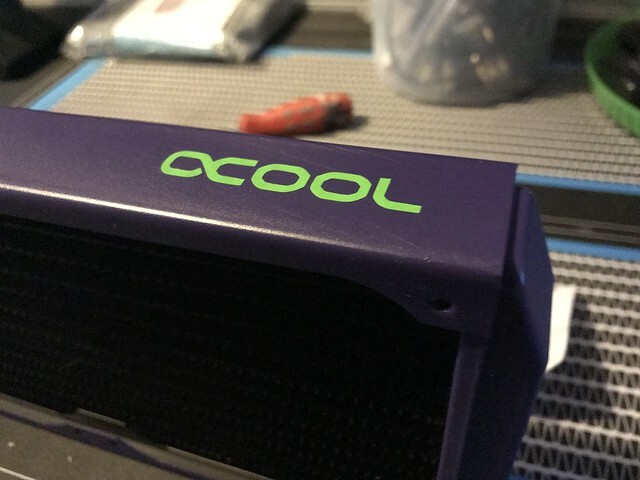 I know I said in the last update we are near the end which we still are, but I decided to paint the 360 rads, I have painted these purple and added the alphacool logo in green to match the cables and the theme. 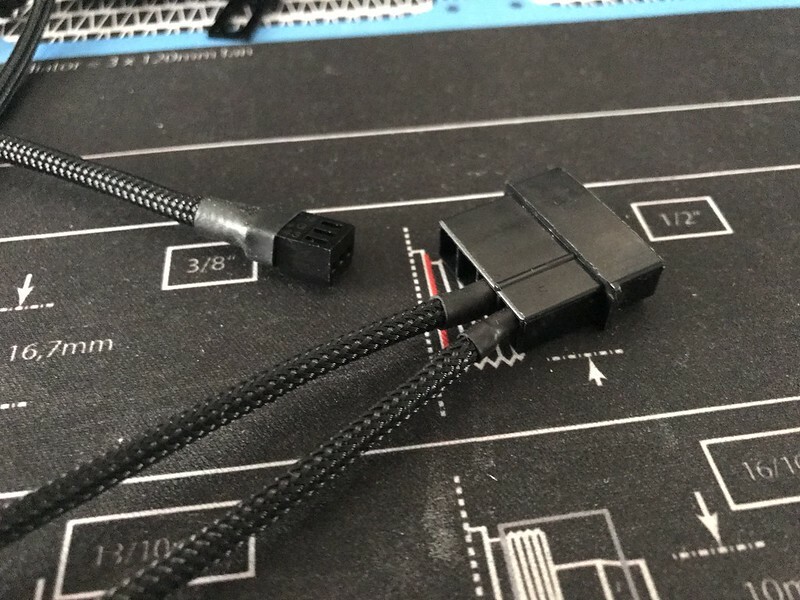 I need to say a big thank you to To the wire - custom sleeving for doing all the cable, he has done a great job. 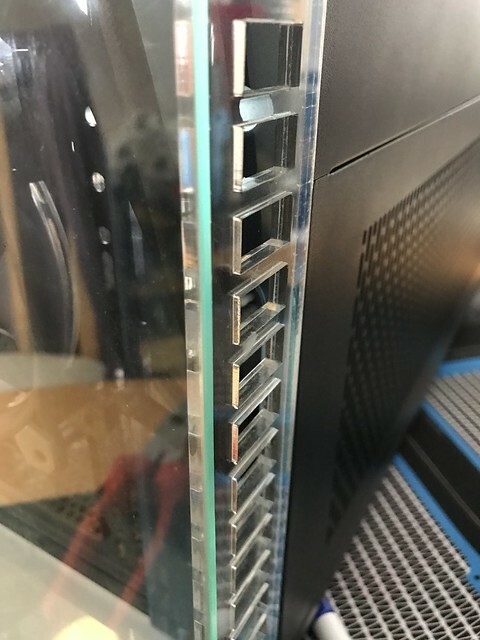 While the case was transported to to the wire - custom sleeving they did say that some fluid had leaked. 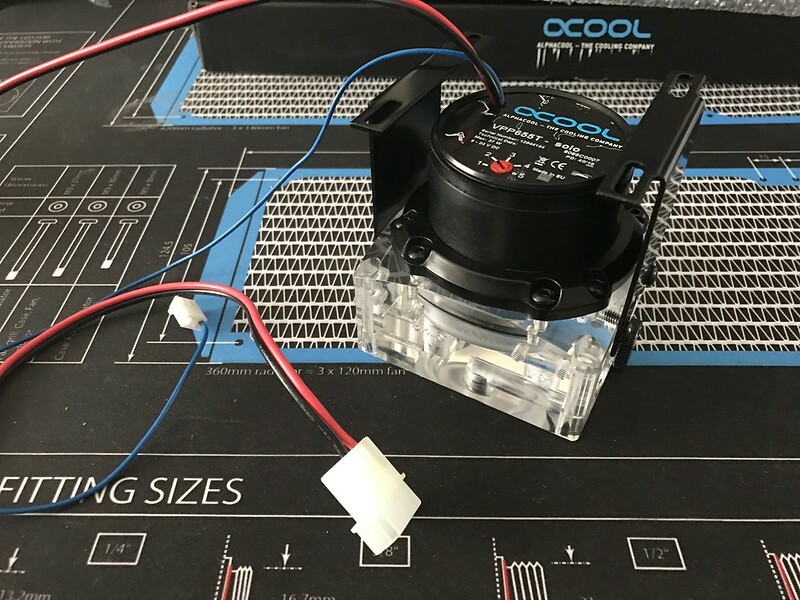 I was not to worried about this as the build had been drained. 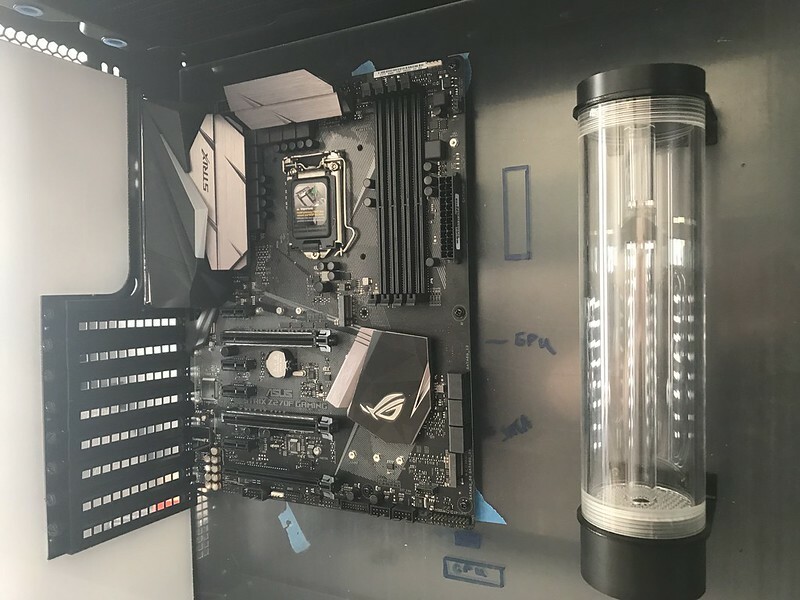 When I got the case back I stripped the full case down to trace the leak and to get the build ready for the final loop. 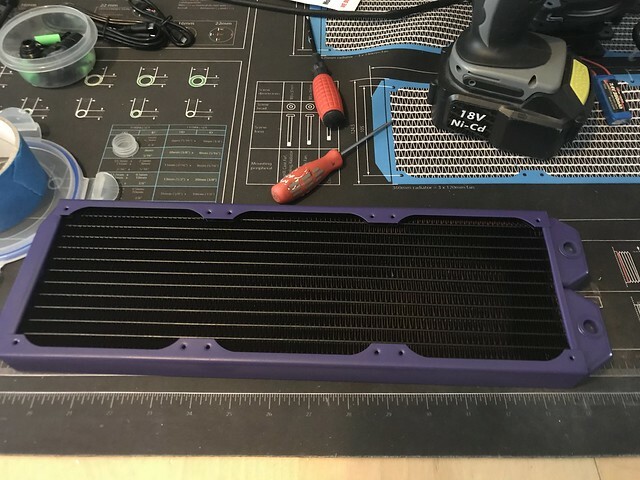 I snapped a bit of the custom motherboard tray when I took the custom res out of the case. I was gutted. 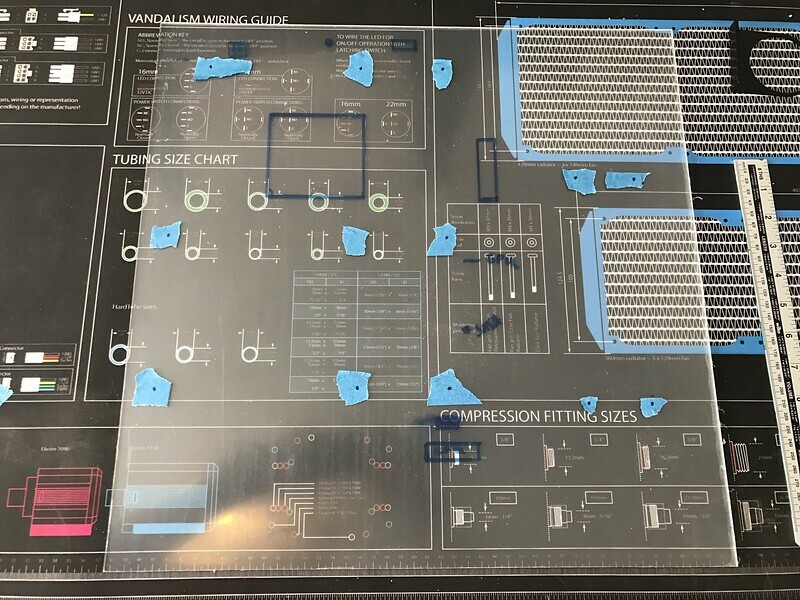 I have order more perplex which I should get any day now, I will do a new custom motherboard tray this weekend for the build, I could have glue it but I want the build to be near enough to what I have picture it to be it will never be perfect. 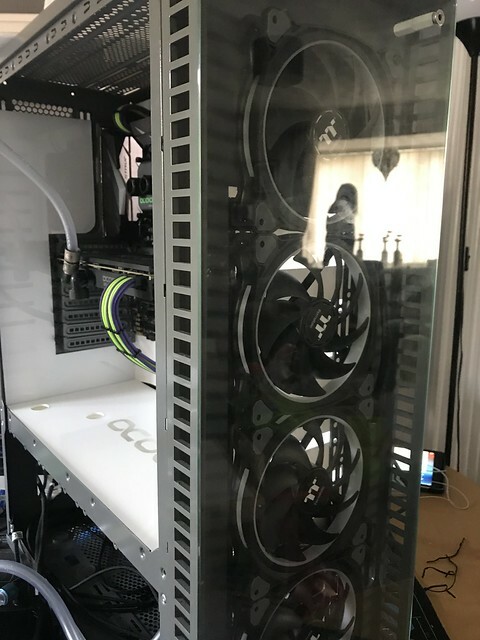 I am really happy on how the front of the case look with the custom front air vents and the tempered glass it really show off the thermaltake riing 140 fans. I have added a few photos below. 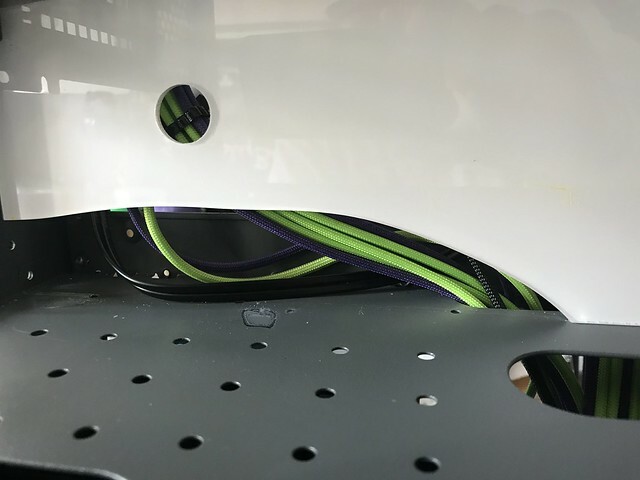 I do need your help I have painted one of the thermaltake fans, purple and green I am thinking of having these on the 360 rad above the motherboard, but I am not 100% feeling it, your input would be great. That's it for this week I will make sure the next post is up on Monday. I am back with a little update, feels like I have been here before. 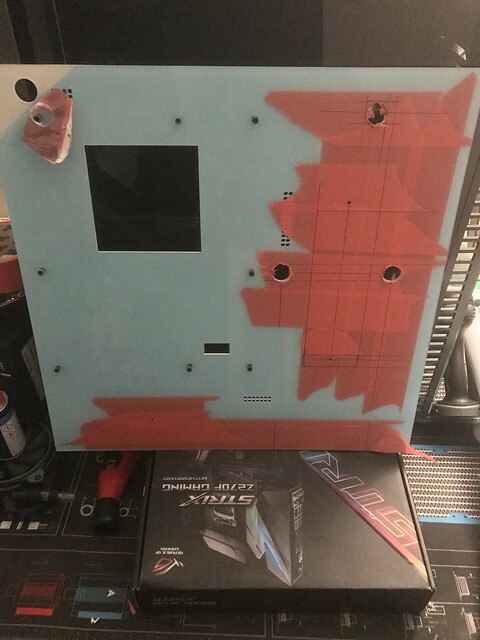 I took the case apart and fully strip it down to bear shell to replace the snapped motherboard tray. 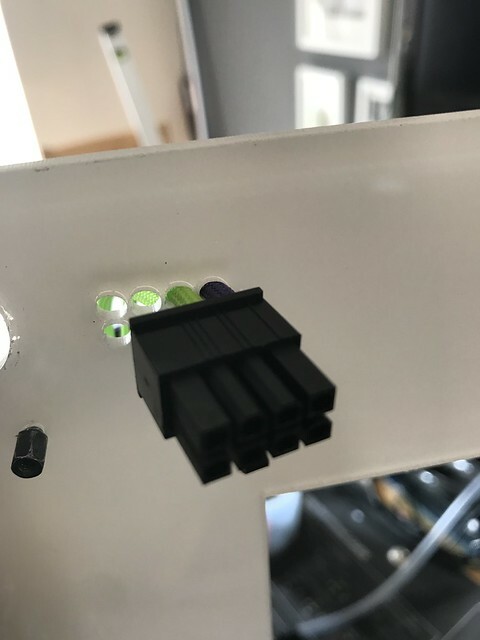 It felt like it took me days to de-pin all the cables that ran through the motherboard tray to the motherboard. 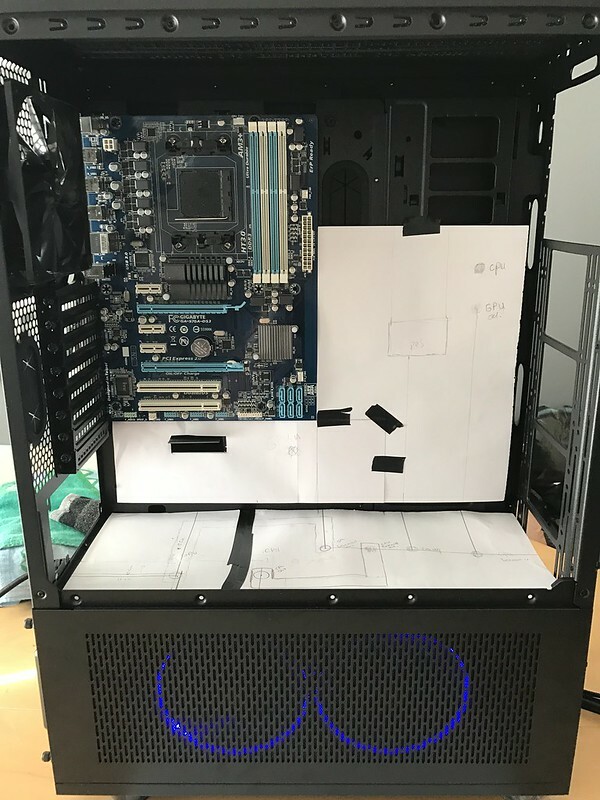 Once I did this I tape up the perplex and mark all the holes for the motherboard standoff once I did this I tap the holes and added the standoffs. 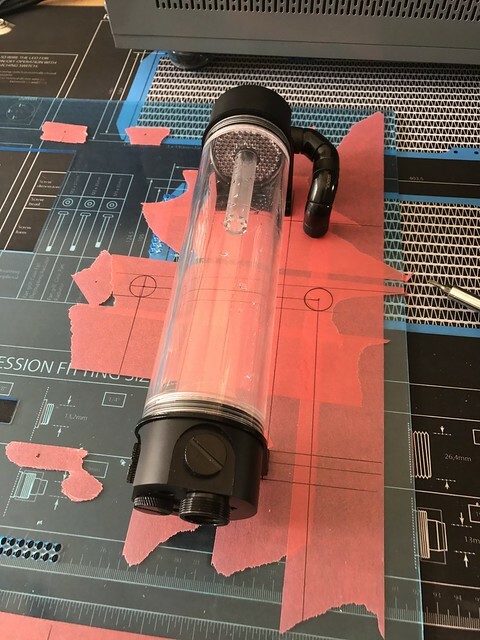 I put the res in the same place as before but I want to change the hole for the pass through for the intake which I think will look a lot cleaner, I don't like to use a lot of fitting if I don't need to. 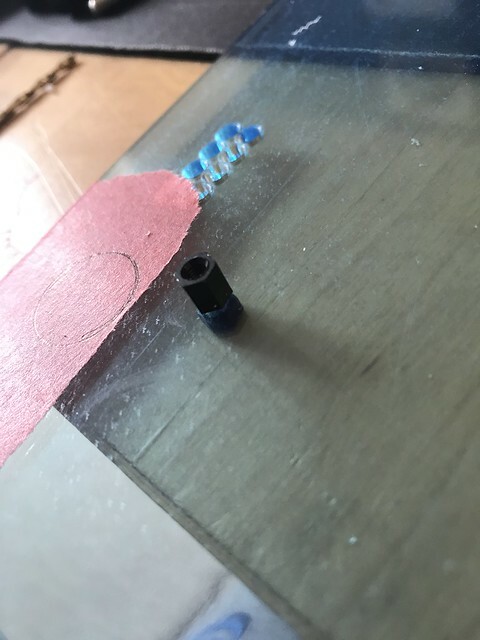 When it came to do all the holes for my pass through hole I could not find my 20mm drill bit, so I pop on amazon and had it next day, it put me back one day, as I don't like to paint until all holes are made. 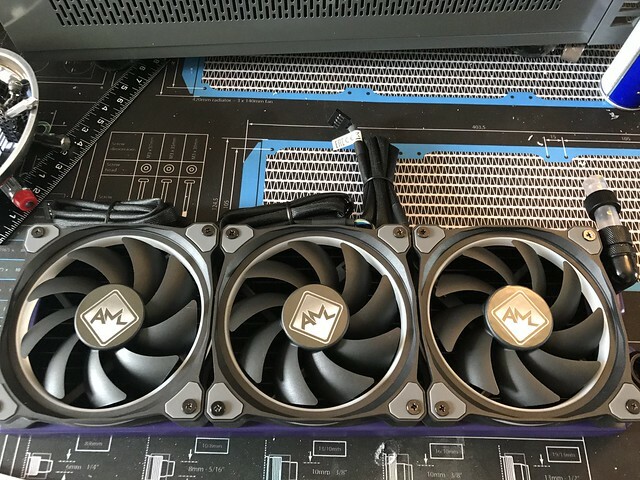 While I was waiting for the drill bit I replace all the logos on the case fans to AML logo. Once I got the drill bit a few minutes later all the holes were done and it was time to paint. 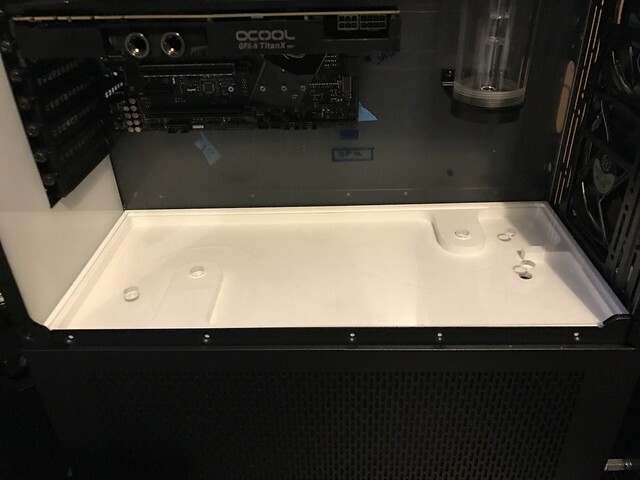 The paint came out great, I fitted motherboard tray back in to the case add the res, motherboard and GPU. I still need to pass all the cables back through and add the the pass through fittings. With me taken the full case apart I am going re do the basement and make it look a little bit nicer. 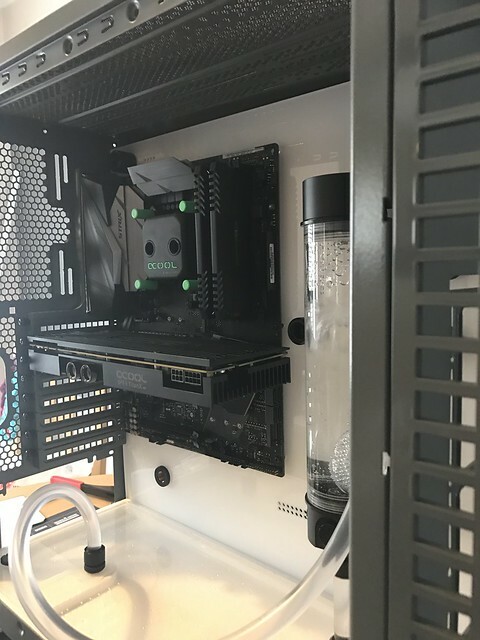 The build it self, I would say is nearly done and like I said in my last post that it will never be 100% complete, but I am very happy with the way it looks, just need to make sure the hard tubing is on point. Your presentation is very methodical and professional. Very impressive! 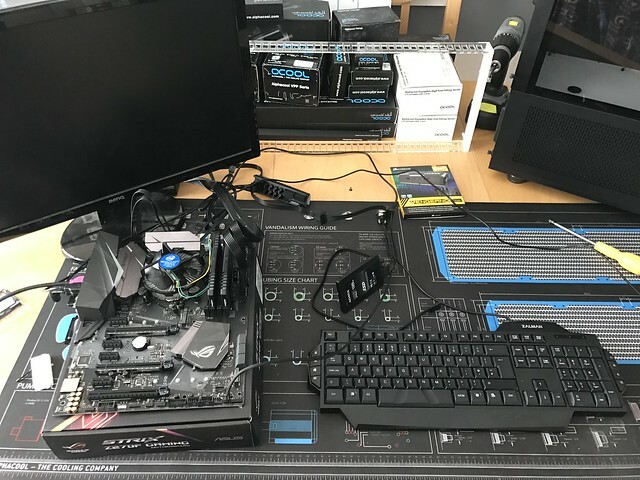 The build is looking beautiful. Amazing work so far. 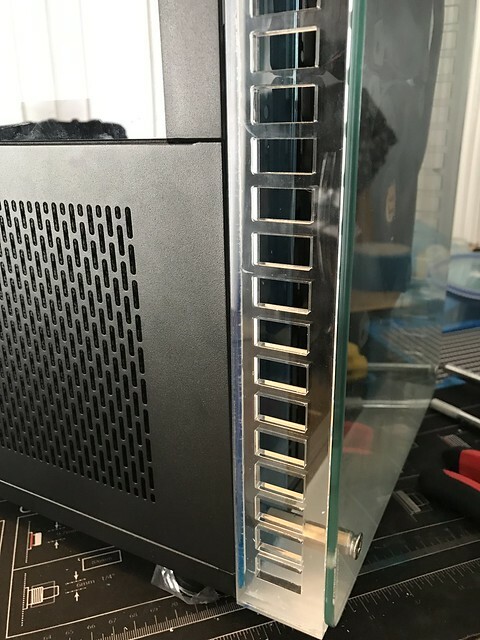 Any mod with perspex gets my repsect. 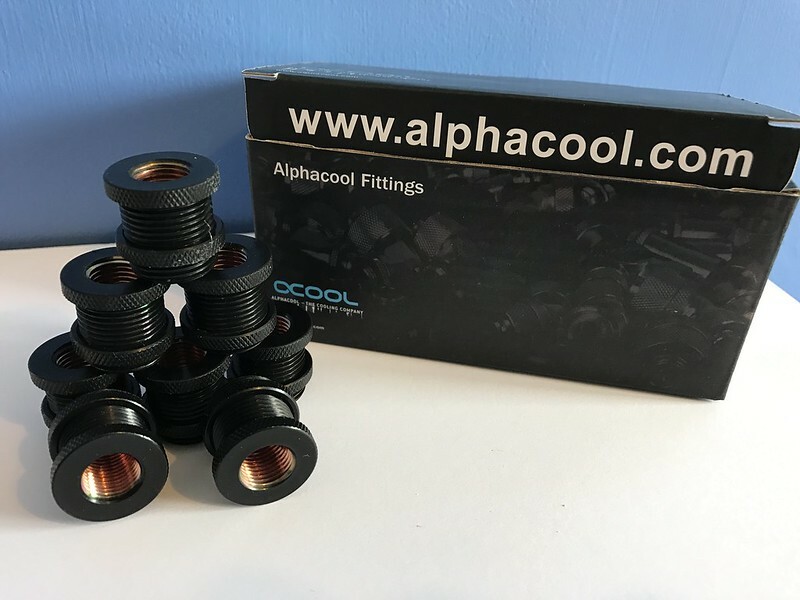 Just want to say a big thank you to all of my sponsors, Alphacool, Nanoxia, thermaltake and to the wire custom sleeving.